Utica 3-Diamonds Logo from 1911 Trademark. 03/18/2019: Added Loc-Rite 23336 Flare-Box Wrench. 01/23/2019: Added Utica 5 Inch Gas and Burner Pliers. 03/05/2016: Added Utica TL-13-A 6 Inch Lineman's Pliers. 01/28/2016: Added Utica 521 Brake Spring Pliers. 01/15/2016: Added Utica 60-5 End Nippers. 01/05/2016: Added Utica [20-6] Flat-Nose Pliers. 01/04/2016: Added Utica 507-10 Rib-Joint Pliers. 12/27/2015: Added Utica 514 Slip-Joint Angle-Nose Pliers. 12/20/2011: Added Utica [2050-8] Box-Joint Lineman's Pliers. 10/26/2011: Added Utica [No. 91] 6 Inch Adjustable Wrench. 06/02/2011: Added Utica 41[-6] Diagonal Cutters. 05/31/2011: Added Wards Master Angle-Nose Pliers. 05/16/2011: Added Utica 82-8 Needlenose Assembly Pliers. 04/20/2011: Added Utica 22-4-1/2 Short Needlenose Pliers. 04/14/2011: Added Utica 7-6 Slip-Joint Combination Pliers. 04/06/2011: Added Utica 524-7 Battery Pliers. 04/05/2011: Added Utica 523-7 Angle-Nose Pliers. 03/08/2011: Added Utica Early [1000-10] 10 Inch Button's Pliers. 02/28/2011: Added Utica 1950-8 Lineman's Pliers. 02/09/2011: Added a Utica [No. 91] 10 Inch Adjustable Wrench. 02/06/2011: Minor reorganization in Lineman's Pliers section, added Utica Early Lineman's Combination Pliers. 02/03/2011: Added Utica Early [No. 3] Hall's Patent Nippers. 01/23/2011: Added Utica 1950-8 Lineman's Pliers. 12/20/2010: Added a Utica [No. 91] 6 Inch Adjustable Wrench. 11/07/2010: Added Utica 52-6 Closed-Nose Side-Cutting Pliers. 09/25/2010: Added Utica 700[-7] "Combination" Lineman's Pliers. 09/15/2010: Added Utica 2050[-6] Box-Joint Lineman's Pliers. 08/11/2010: Added Utica  10 Inch Button's Pattern Pliers. 07/31/2010: Added a Utica Early [No. 91] 6 Inch Adjustable Wrench. 07/21/2010: Added Utica "Russell Patent" Staple-Pulling Pliers. 07/20/2010: Added Utica 654-6 Needlenose Pliers. 07/15/2010: Added Utica [HS-180] Button's Pattern Pliers and Utica 14 Combination Pliers. 07/05/2010: Added Lakeside 10 Inch Button's Pattern Pliers. 06/22/2010: Added Utica Early 8 Inch Button's Pattern Pliers. 06/20/2010: Added Utica Early 1300 6 Inch Gas and Burner Pliers. 06/17/2010: Added Utica Early 6 Inch Button's Pattern Pliers and Utica Early [1000-6] "Giant" Button's Pattern Pliers. 06/16/2010: Added section on contract production, added Utica 60-7 End Nippers. 06/14/2010: Added Utica Early [No. 50-4] Lineman's Pliers. 06/13/2010: Reorganized pliers section, added Utica Early [No. 50-6] Lineman's Pliers, Utica Early [1000-8] "Giant" Button's Pattern Pliers, and Utica 2001-8 Side Cutting Button's Pattern Pliers. 06/01/2010: Added Utica "Russell Patent" Staple-Pulling Pliers. 05/05/2010: Added Utica 550-8 "Pistol Grip" Combination Pliers. 05/03/2010: Added Utica Early [90-10] 10 Inch Adjustable Wrench. 04/28/2010: Added Utica 130[-8] Gas and Burner Pliers. 10/31/2009: Added Utica 65-5 Jeweler's End Nippers. 10/27/2009: Added Utica No. 50-8 8 Inch Lineman's Pliers. 10/21/2009: Added Utica No. 86 8 Inch Long Flat-nose Pliers. 09/19/2009: Added Utica 522-7-1/2 Long-Jaw Battery Pliers. 08/26/2009: Added Utica Early 8 Inch Button's Pattern Pliers. 08/17/2009: Added Utica 524-7 Battery Pliers. 08/03/2009: Added Utica 3000 6 Inch Button's Pliers with Opening Stops. 07/26/2009: Added Utica 708 8 Inch Lineman's Combination Pliers. 07/02/2009: Added Utica 511-6 Combination Pliers. 06/15/2009: Added Utica 86-6 Long Flat-Nose Pliers. 06/10/2009: Added Utica 513-5 1/2 Combination Pliers with Side Cutters. 06/09/2009: Added Utica Early  8 Inch Gas and Burner Pliers. 05/31/2009: Added a Utica Early [No. 90] 10 Inch Adjustable Wrench. 05/30/2009: Added Utica 50-8 Lineman's Pliers. 05/24/2009: Added Utica 528 Battery Pliers. 05/23/2009: Added Utica 700 6 Inch "Combination" Lineman's Pliers and a Utica Early [No. 90] 12 Inch Adjustable Wrench. 05/17/2009: Added Utica 1050[-8] 8 Inch Lineman's Pliers. 05/14/2009: Added a Utica [90-10] 10 Inch Adjustable Wrench. 05/10/2009: Added a Utica Early 6 Inch Adjustable Wrench. 05/09/2009: Added Utica 512 Bent-Nose Combination Pliers. 03/23/2009: Added Utica TL-13-A Lineman's Pliers. 03/04/2009: Added Utica 1000-8 Button's Pliers. 02/01/2009: Added Utica Early 655 6 Inch Needlenose Pliers. 01/23/2009: Added Utica Early No. 50 8 Inch Lineman's Pliers. 01/16/2009: Added links to advertisements. 12/24/2008: Added Utica Early 8 Inch Lineman's Pliers. 09/08/2008: Added Utica 1050-8 Lineman's Pliers. 09/01/2008: Added Utica 6000 Box-Joint Slip-Joint Pliers. 08/30/2008: Added Utica 20-6 Flat-Nose Pliers. 08/29/2008: Added Utica 655-6 Needlenose Pliers. 08/16/2008: Added Utica 1300-8 Gas and Burner Pliers. 06/12/2008: Added Utica 896 Needlenose Cutting Pliers. 05/23/2008: Added a Utica 92-8 Locking Adjustable Wrench. 05/17/2008: Added Utica 529 Soft-Grip Pliers. 03/17/2008: Added Utica 1950-6 Lineman's Pliers. 03/12/2008: Added Utica Early [50-8] Lineman's Pliers. 02/14/2008: Added Utica BX100 Armor-Cutting Pliers. 02/10/2008: Split into two pages, added Utica Early No. 91 Adjustable Wrench. 01/25/2008: Added Utica 525 Brake Spring Pliers. 01/14/2008: Added Utica Early Slip-Joint Pliers. 12/10/2007: Added Utica Early [No. 50] 6 Inch Lineman's Pliers. 12/01/2007: Added Utica Early 1300-7 Gas and Burner Pliers. 11/28/2007: Added Utica 260-6 End Nippers. 11/13/2007: Added Utica No. 60 6 Inch End Nippers. 11/04/2007: Added Utica 517-10 Waterpump Pliers. 10/25/2007: Added a Utica Early No. 90 Inch Adjustable Wrench. 10/11/2007: Added Utica 21-4 Round-Nose Pliers. 09/16/2007: Added Utica 43 6 Inch Box-Joint Diagonal Cutters. 09/13/2007: Added Utica 20 4 Inch Flat-Nose Pliers. 08/16/2007: Added Utica 1000-10 Giant Button's Pliers. 08/15/2007: Added Utica Early 1300-6 Gas and Burner Pliers. 08/11/2007: Added Utica Early 22-6 Short Needlenose Pliers. 08/04/2007: Added Utica 1-7 Battery Pliers. 07/23/2007: Added Utica 260-6 End Nippers. 07/19/2007: Added Utica No. 50 [-6] Lineman's Pliers. 07/04/2007: Added Utica 517-5 Ignition Pliers. 06/30/2007: Added Utica 517-5 Ignition Pliers. 06/25/2007: Added Utica 39-7 Diagonal Cutters. 05/28/2007: Added a Utica 3/4 Star Drill. 04/18/2007: Added Utica 22-6 Short Needlenose Pliers. 04/17/2007: Added Utica 517 Ignition Pliers. 04/15/2007: Added Utica Early Slip-Joint Combination Pliers. 04/08/2007: Added Utica 41-6 Diagonal Cutters. 03/30/2007: Added Utica Early 41-6 Diagonal Cutters. 03/23/2007: Added Utica Early No. 22 Needlenose Pliers. 03/20/2007: Added Utica 45-6 Aviation Diagonal Cutters. 03/16/2007: Added a Utica No. 90-8 Adjustable Wrench. 03/11/2007: Added Utica 41-6 Diagonal Cutters. 03/10/2007: Added a Utica Early No. 91-10 Adjustable Wrench. 03/02/2007: Added Utica 260-7 End Nippers. 02/27/2007: Added Utica No. 29 Staple-Pulling Pliers and Utica Early Wire-Cutting Pliers. 02/22/2007: Added Utica 360-7 End Nippers. 02/17/2007: Added Utica 1950-6 Lineman's Pliers. 02/08/2007: Added a Utica No. 90-12 Adjustable Wrench. 02/07/2007: Added Utica 8-6 Combination Pliers. 02/06/2007: Added Utica 654-6 Needlenose Pliers. 02/05/2007: Updated description of 507-10 pliers, added Utica No. 15 Specialty Nippers, Utica No. 31 Duckbill Pliers, and Utica 50-6 Lineman's Pliers. 01/20/2007: Added Utica 534 Lock-Ring Pliers. 01/08/2007: Added Utica 1033-6 Needlenose Pliers. 01/05/2007: Added Utica 38-4 Diagonal Cutters. 01/04/2007: Added Utica 22-5 Short Needlenose Pliers. 12/17/2006: Added Utica 227 Needlenose Pliers. 12/16/2006: Added Utica 777-6 Needlenose Pliers and Later Utica 1300-6 Gas and Burner Pliers. 12/15/2006: Added Utica Early [No. 1950] Lineman's Pliers. 12/11/2006: Added Utica 524 Battery Pliers. 12/08/2006: Added Utica 87-7 Duckbill Pliers. 12/07/2006: Added Utica 40-7 Diagonal Cutters. 12/06/2006: Added patent table plus Utica Early Side-Cutting Pliers. 12/05/2006: Added Utica 21 Round-Nose Pliers and Utica 888-6 Bent Needlenose Pliers. 12/04/2006: Moved to separate page, added Utica 50-7 Lineman's Pliers. 12/03/2006: Added Utica 50-8 Lineman's Pliers, Utica 511-8 Pliers, and Utica 531-8 Pliers. 12/01/2006: Added Utica 259-6 Lineman's Pliers. 11/28/2006: Added Utica 517-10 Waterpump Pliers. 11/21/2006: Added Utica No. 50 Lineman's Pliers. 11/20/2006: Added Utica B120 Pliers. 11/19/2006: Added Utica 5000 Slip-Joint Pliers. 11/10/2006: Added Utica 1300-6 Gas and Burner Pliers. 10/22/2006: Added Utica 1300-10 Gas and Burner Pliers. 09/08/2006: Added Utica No. 20 Flatnose Pliers. 08/28/2006: Added Utica No. 82 Needlenose Pliers. 06/16/2006: Added Utica 511-10 Pliers. Utica Drop Forge & Tool was an important early maker of pliers, nippers, and other hand tools. The company was a pioneer in the production of low-cost but high-quality pliers, and later became an important producer of adjustable wrenches as well. In the 1950s Utica was on the vanguard of the consolidation of the tool industry, becoming the first company in a roll-up that eventually included Herbrand, Bonney, and Diamond. The Utica Drop Forge & Tool Company was founded in 1895 by W. Pierrepont White and Hubert L. White in Utica, New York. The company initially operated as a maker of pliers and nippers, with their first address at 75 Genesee Street in Utica. Among the company's first products were the Hall's Patent Nippers, a popular tool based on patents by Thomas G. Hall. 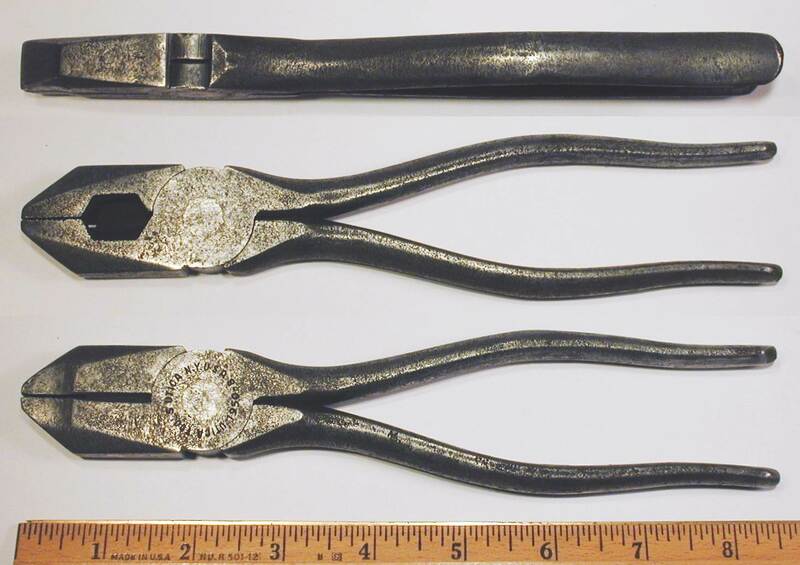 These nippers had previously been manufactured by the Interchangeable Tool Company, which is believed to have had a family connection with the inventor, as one Henry G. Hall served as president during the 1880s. The small notice at the left was published on page 346 of the July 1896 issue of Machinery, and the text notes that the Hall patents were now owned by Utica Drop Forge. Also included in Utica's early products were the Russell patent staple-puller pliers, for which it had signed a contract with the Russell Hardware and Implement Company in January of 1900. As it turned out, this contract later lead to a lawsuit over royalty payments, and by virtue of the resulting court records, we have an unusually detailed account of this early part of Utica's business activities. Russell Hardware was the owner of the main patent #545,537 for the staple-pulling pliers, issued on September 3 of 1895, and had been producing the pliers since 1895. Russell had also later acquired rights to a related "Heard patent" of June 14, 1892. As required in the contract with Russell, Utica initially assumed responsibility as the sales agent for Russell's production of the pliers, then by April of 1901 Utica had commenced production of the pliers in their own factory. Based on the court documents, the Utica production of the pliers from 1901 through about March of 1904 was marked with both the 1895 and 1892 patents, and during this time the pliers were advertised as the "Russell Staple Puller". The advertisement at the left, published in a 1901 issue of Science and Industry, shows the Utica version of the Russell staple-pulling pliers. Note the use of the 3-Ovals logo on the pliers; this advertisement is currently the earliest known usage of the 3-Ovals mark. The court case documents indicate that some time after 1904 Utica stopped marking the pliers with the Russell patents, and the pliers were described as "Utica Improved Staple Pullers", evading the royalties and triggering the lawsuit. The advertisement at the left from a 1902 issue of Telephone Magazine shows another example of Utica's early production, a pair of compound leverage nippers. This style of nippers were generally referred to as "Hall's Compound Lever Nippers", after the early patent #209,677 issued to T.G. Hall in 1878. Another detail to note in this advertisement is the inclusion of Smith & Hemenway as a contact company. During the early 1900s Utica appears to have had a joint sales agreement with Smith & Hemenway, perhaps to gain access to the S&H New York City address. The two companies published joint catalogs of their products while the agreement was in effect. However, the agreement seems to have had a relatively short duration, and by 1908 (or before) the companies were advertising separately. By 1906 Utica Drop Forge had moved to a new location at 800 Whitesboro Street in Utica, New York. This address is reported in a 1906 ASME Yearbook entry for H.F. Kelleman, who was listed as the Superintendent of Utica Drop Forge. Another glimpse of Utica's early production is provided by a 1906 advertisement for "Utica Pliers & Nippers" printed at the back of the Popular Mechanics Shop Notes for 1906. The illustration at the left shows the No. 1650 Box-joint side cutters, No. 50 Side Cutters, No. 700 Combination Side Cutters, No. 1000 Giant Button's Pliers, and No. 60 End Nippers. This advertisement also makes prominent use of the Utica 3-Ovals logo in the text, which claims it as a trademark. As we currently don't have any Utica catalogs covering this early period, this type of advertisement has been very valuable in documenting their products of the time. In 1907 the company's factory was destroyed by fire, and when their new factory opened in 1908, the company had extended their products to a full line of pliers. Utica continued as a maker of pliers and related tools for many years after this. In 1911 Utica registered their well-known 3-Diamonds logo as a trademark, which was then used extensively in advertisements and as a marking on the tools. The advertisement at the left, published in 1912 in Volume 23 of The World's Work, shows the new 3-Diamonds trademark prominently displayed in the corners. Note that the pliers in the illustration have smooth (non-patterned) handles; we'll refer to this again shortly. Another example of the trademark can be seen in an advertisement in the January-June 1912 issue of The American Review of Reviews, with Utica Pliers on page 104. The new 3-Diamonds logo is displayed in the upper corners of the ad, and the text notes the logo as a registered trademark. 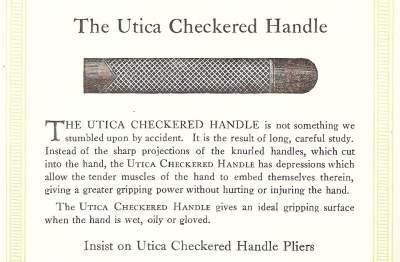 1915 Catalog Illustration of Utica Checkered Handle. 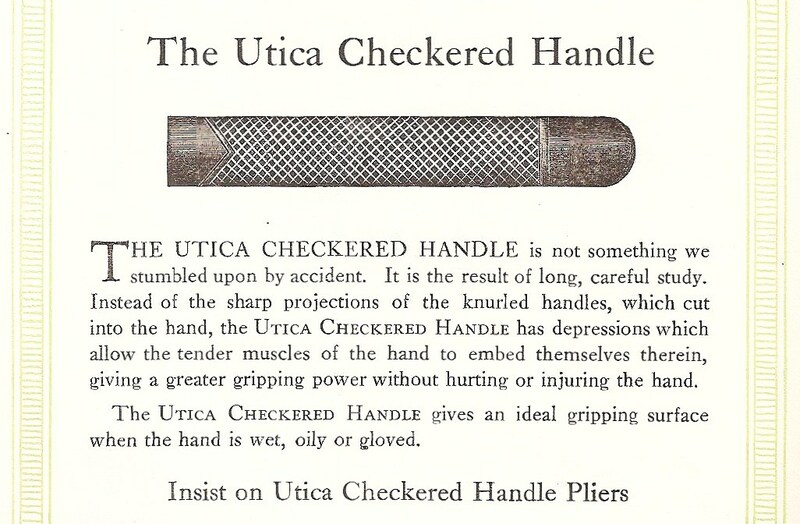 Sometime around 1913 Utica began offering patterned handles with some of their plier models. Utica's earliest pattern was a diamond checkered field extending back from the middle of the handle, with a V-shaped opening towards the front of the pliers. An illustration of the gripping pattern can be seen at the left, as found near the back of the 1915 Utica catalog. The text explains the advantages of the pattern and takes care to point out that the pattern is not produced by knurling. Utica's handle pattern appears to have been produced by a secondary forging process, as the gripping pattern is usually found with a forged-in 3-Diamonds logo on the underside of the handles. In addition, pliers with patterned handles rarely show any trace of the parting line from the original forging die. A secondary forging step would also allow the handles to be given a more precise shape, for example, a fashioned handle to fit the hands better. An example of the checkered gripping pattern in an advertisement can be seen in the illustration at the left, published in the November 1913 issue of McClure's magazine. This is the earliest advertisement showing Utica pliers with patterned handles found so far. Another example of the checkered handle pattern can be seen on the Utica Early 1300 Gas and Burner Pliers in a later section of this article. The introduction of handle patterns was probably intended both to improve the functionality and appearance of the pliers. Utica's competitors, such as Kraeuter & Company, were also producing pliers with attractive and functional gripping patterns around this same time. A review of Utica's published advertisements found no examples of patterned handles for 1912, but several examples for 1913. This suggests late 1912 or early 1913 as the introductory date of the pattern feature. A "Utica Nippers and Pliers" catalog from about 1926 listed numerous models of pliers and related tools such as tin-snips. The catalog gives the company's address as 2800 Whitesboro Street in Utica. Sometime in the 1930s Utica broadened their product line to include Crescent-style adjustable wrenches. The wrenches were initially made of carbon steel, but by the late 1930s Utica was offering both carbon steel and alloy steel models. More information on these important tools can be found in the later section on Adjustable Wrenches. In 1967 Kelsey-Hayes sold its tool division to the Triangle Corporation, and the renamed Utica Tool Company operated as a division of Triangle for a number of years. Triangle was later acquired by Cooper Tools. 419,666 T.G. Hall 04/27/1881 01/21/1890 Compound-Leverage Nippers Utica [No. 3] Hall's Patent Nippers. Assigned to Interchangeable Tool Company. In the early 1900s Utica used a trademark consisting of three oval chain links enclosing the letters "(U)(TI)(CA)", very similar to the later 3-Diamonds trademark. The registration for this trademark was recently discovered and provides the first use date as April 6 of 1900. This early 3-Ovals logo was superseded by the 3-Diamonds logo in late 1910. In 1911 Utica registered their "3-Diamonds" trademark, consisting of the company name as "U-TI-CA" enclosed by three interlocking diamonds. The first-use date was listed as December, 1910, and this well-known 3-Diamonds logo continued to be marked on their tools for many years. In 1948 the "Utica" name in plain text was registered as a trademark, again with the first use listed as December, 1910. In 1949 the text "Utica Tools" in a semicircle was registered as a trademark, with the first use listed as December, 1943. Utica used the mark "Lubring" as a trademark for pliers with a patented lubrication insert, but the mark is not listed in the USPTO trademarks database. Utica [3-Ovals Logo] 04/06/1900 07/28/1900 10/30/1900 35,363 Application signed by W. Pierrepont White, President. Utica [3-Ovals Logo] 04/06/1900 05/16/1905 01/23/1906 49,173 Illustration of linked chain with (U)(TI)(CA). 12/01/1910 01/16/1911 10/10/1911 83,793 Utica 3-Diamonds logo. Application signed by Henry F. Kellemen, Vice-President. Utica 12/01/1910 08/10/1948 04/04/1950 523,494 Block text. Utica Tools [logo] 12/01/1943 02/21/1949 08/08/1950 528,778 Text in a semicircle. Utica tools are generally not marked with a date code or other explicit indication of the manufacturing date. In some cases, the manufacturing date for a tool can be estimated based on the markings or other observed information. The following list of observations may be helpful in estimating the manufacturing date for some tools. 3-Ovals Logo. By the early 1900s Utica was marking its tools with a logo resembling three chain links containing the letters for UTICA, similar to "(U)(TI)(CA)". We'll refer to this as the 3-Ovals logo in the text here. The trademark registration states that this mark was first used on April 6, 1900, and currently the earliest known advertisement using the 3-Ovals logo is from 1901. The 3-Ovals logo remained in use until at least 1910, after which it was superseded by the 3-Diamonds logo. 3-Diamonds Logo. In 1911 Utica filed a trademark application for a logo with UTICA inside three linked diamonds, similar to "<U><TI><CA>". The trademark was registered with the first use listed as December 1, 1910. This well-known trademark remained in use for many years and is referred to as the 3-Diamonds logo in the text here. 3-Ovals with 3-Diamonds. A small number of tools have been found with both the 3-Ovals and 3-Diamonds markings, typically with the 3-Ovals logo stamped on the front and the 3-Diamonds logo forged into the underside of the handle. These are presumed to be transitional tools made from late 1910 to around 1914, as the older marking was being phased out. Early Diamond Checkered Handle Pattern. 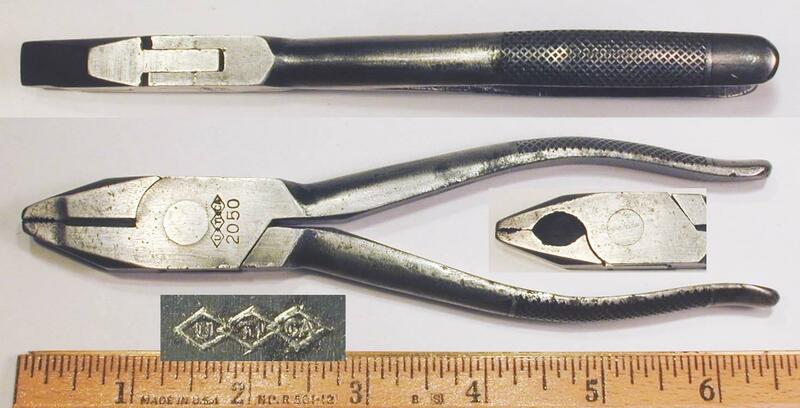 Sometime around 1913 (or late 1912) Utica began using a diamond checkered gripping pattern on some of their plier models, typically with a "V" opening towards the front of the pliers. A number of advertisements from 1913 have been found with the checkered pattern visible in the illustrations, and the 1916 J.M. Waterston catalog includes illustrations of Utica pliers with the diamond checkered gripping pattern. 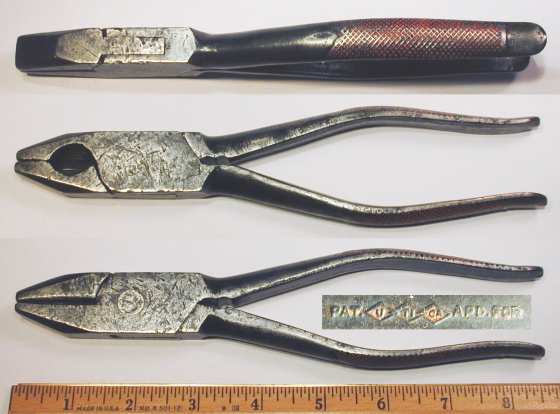 Prior to the adoption of handle patterns, plier handles had been finished with rough or fine grinding, and the parting line from the forging process was often still visible on the underside of the handles. 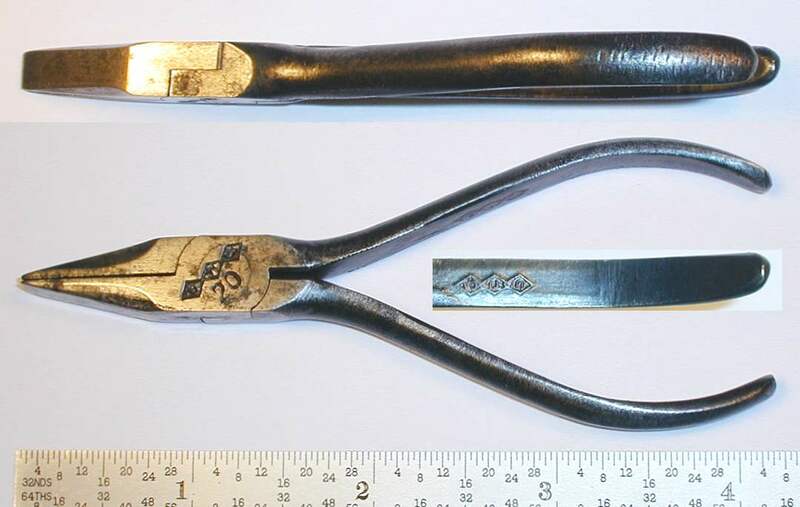 An example of this early gripping pattern can be seen on the Utica Early 1300 Gas and Burner Pliers. Model Number Marking. Earlier Utica tools were generally not marked with the catalog model number, although some early advertisements do show model numbers. Utica began marking model numbers consistently around 1920, although the exact date is not yet known. The presence of a model number marking is probably a good indicator of relatively later production. Squared-Off Diamond Checkered Handle Pattern. Utica later made a minor change to its diamond checkered gripping pattern by making the ends of the pattern squared off relative to the handle, instead of with a V-shaped opening towards the front. (For example, compare the Utica Early [No. 50-6] and Utica No. 50 pliers.) This change appears to have been made sometime in the 1920s, although the exact date is uncertain. For reference, most pliers with marked model numbers have the squared-off handle pattern (prior to the late 1940s), and most pliers without model numbers have the V-shaped pattern. "Alloy Steel" Marking. Utica began using alloy steel for pliers sometime around 1930, around the same time that its competitors Crescent Tools and Diamond Calk Horseshoe also adopted alloy steel. Utica added an "Alloy Steel" marking to its pliers for a period of time, probably from early the 1930s to early 1940s. Currently we do not know of any examples of the alloy marking with the later "Utica Tools" marking style, suggesting a cutoff date of late 1943. "Utica Tools" Trademark. Utica registered a trademark with the words "Utica Tools" arranged in a semicircular arc, with the first use listed as December 1, 1943. Utica, N.Y. U.S.A. Marking. The "U.D.F.&T." name was later simplified to just "Utica" or "Utica Tools", followed by the location in Utica, NY. This change was probably made around 1944 as part of the change to the "Utica Tools" trademark. "Lubring" Patent and Trademark. The patent associated with the "Lubring" trademark was filed in 1944. Plain Handles, Again. Sometime in the mid to late 1940s Utica dropped its patterned handle feature in favor of polished plain handles. We're not sure of the exact date, but most pliers with the "Utica Tools" marking have plain handles. Tongue-and-Groove Patent. The patent for Utica's "Rib-Joint" tongue-and-groove pliers was filed in late 1951. Utica USA Marking. Tool markings were further simplified to just "Utica USA" some time between 1956 and 1961, probably after 1960. The timing is based on examples of pliers obtained in original boxes, which noted Utica as a division of Kelsey-Hayes, but with the location still in Utica, New York. This change was likely made in anticipation of the move to Orangeburg, South Carolina, which took place in 1962. A 1906 report from the New York appellate court on the Russell Hardware v. Utica Drop Forge [External Link] case provided background information on Utica's early contract with Russell Hardware. Product information was obtained from a number of Utica catalogs, as summarized in the table below. N/A Utica Nippers and Pliers 1915 Half size New products for 1915 include No. 130 and Nos. 706-708. Pliers illustrated with checkered handles. N/A Utica Automotive Tools 1939 Booklet No. 91 adjustable wrench shown with raised panel. Adjustable wrenches in sizes from 4 to 24 inches. (Price List) Utica Tools 1941 Full size Price list with illustrations. Both No. 90 and No. 91 adjustable wrenches of alloy steel. Adjustable wrenches illustrated with web-like panel. No. 63-D Utica Tools 1951? Full size Adjustable wrenches with stamped markings. No. 66 Utica Tools 1952 Full size "Rib-Joint" tongue-and-groove pliers available. No. 67 Utica Tools 1956? Full size Division of Kelsey-Hayes. No. 695 Utica Tools 1975? Full size Division of Triangle Tools in Orangeburg, SC. Utica tools were available through many industrial and automotive distributors, and the catalogs from these companies offer additional product information. Chandler & Farquhar 1910. The 1910 catalog No. 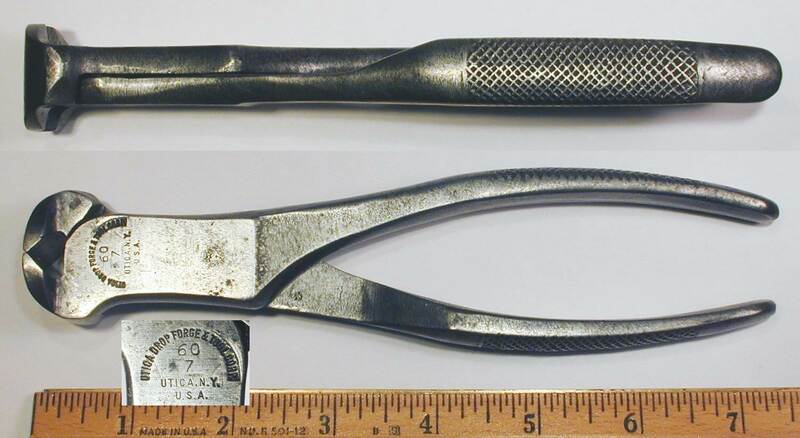 115 from the Chandler & Farquhar Company, an industrial distributor, lists only one model of Utica pliers, the No. 3 Compound Nippers. The illustration shows the markings "U.D.F.&T. Co." with the 3-Diamonds logo. J.M. Waterston 1916. The 1916 catalog No. 22 from J.M. Waterston, a tool distributor based in Detroit, lists two models of Utica pliers on page 191. The Utica No. 1000 Giant Button's Pliers are offered in four sizes from 4.5 to 10 inches nominal, with prices ranging from $0.40 to $0.65. The illustration shows pliers with handles with the diamond checkered gripping pattern, and the markings have "U.D.F. & T. Co." and the 3-Diamonds logo stamped around the pivot. Also listed are the No. 5002 combination pliers in the 6 inch size for $0.25 each. These pliers also have the diamond checkered gripping pattern on the handles, and the Utica 3-Diamonds logo is shown forged into the underside of the handles. Later pages list three additional Utica models, the No. 654 Long Chain Nose Side Cutting Pliers, the No. 1950 Heavy Side Cutting (Lineman's) Pliers, and the No. 325 Round Nose Combination Pliers. The illustrations show the No. 654 and No. 1950 with the diamond checkered gripping pattern on the handles. Ducommun Catalog "E" 1918. The 1918 catalog "E" from the Ducommun Hardware Company of Los Angeles lists a wide selection of Utica pliers on pages 285 through 298. The listings include the No. 3 compound end nippers, Nos. 50, 350, 1050, 1950, and 3050 lineman's pliers, Nos. 1000 and 3000 Button Pattern pliers, No. 1300 gas and burner pliers in sizes 5, 6, 7, 8, and 10 inches, Nos. 1900 and 1909 fencing pliers, and the No. 6000 box-joint slip-joint pliers. Chandler & Farquhar 1919. The 1919 catalog from Chandler & Farquhar lists two pages of Utica pliers, with the models including the No. 50 Side Cutting Pliers, No. 1000 Giant Button's Pliers, and No. 3 Compound Nippers. Cragin & Company 1921. The 1921 catalog No. 2 from Cragin & Company of Seattle lists two pages of Utica pliers. The models include Nos. 11, 20, 21, 42, 55, 60, 612, 655, 700, 1000, 1050, and 1950. Marwedel 1922. The 1922 catalog No. 11 from the C.W. Marwedel Company, an industrial supplier, includes three pages of Utica pliers. The models shown include the No. 3 Compound Nippers, Nos. 60 and 360 End Nippers, No. 130 Gas and Burner Pliers, No. 1000 Giant Button's Pliers, and No. 4000 Slip Joint Box Joint Pliers. Ducommun Catalog "G" 1926. The 1926 catalog "G" from the Ducommun Corporation of Los Angeles lists a wide selection of Utica pliers on pages 289 through 301. White Tool and Supply 1928. The 1928 catalog "B" from the White Tool and Supply Company, a Cleveland-based industrial distributor, lists Utica pliers on pages 185 and 186. Samuel Harris 1931. The 1931 catalog No. 57 from the Samuel Harris Company, an industrial supplier, lists several models of Utica pliers. The models listed are the No. 1 Battery Pliers, No. 16 Battery Terminal Lifters, No. 42 Diagonal Cutters, and No. 1000 Giant Button's Pliers. Utica advertised its products in trade journals and popular magazines beginning in the early 1900s. The following links show examples of some of these ads. A full-page ad at the back of the Popular Mechanics Shop Notes for 1906 shows several models of Utica Pliers & Nippers, including the No. 1650 Box-joint side cutters, No. 50 Side Cutters, No. 700 Combination Side Cutters, No. 1000 Giant Button's Pliers, and No. 60 End Nippers. The text shows the use of the early linked-chain form of the Utica 3-Diamonds logo. An ad on the back page of the October 1906 edition of Popular Mechanics offers the Utica No. 1000 Giant Button's Pliers, in sizes of 4 1/2, 6, 8, and 10 inches. The illustration shows the underside of the handles with "Pat. Apd. For", and the text shows the linked-chain form of the Utica 3-Diamonds logo. The text shows the linked-chain form of the Utica 3-Diamonds logo, and the company address is listed as 75 1/2 Genesee Street in Utica. A full-page ad on page 1228 of the June 1910 edition of the Hardware Dealer's Magazine shows the Utica No. 1300 Gas and Burner Pliers. The text shows the linked-chain form of the Utica 3-Diamonds logo. In this section we'll look at some examples believed represent Utica's early production, with manufacturing dates ranging from 1895 up to around 1910. 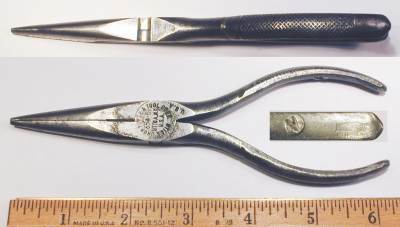 Among the earliest tools produced by Utica were the Hall's Patent nippers, a popular style of compound-leverage end nippers capable of cutting hardened wire. The earliest of the Hall's patents actually dates to 1867, long before the founding of Utica Drop Forge. Subsequent improvements were patented in 1878, 1884, and 1890. Fig. 2. Utica [No. 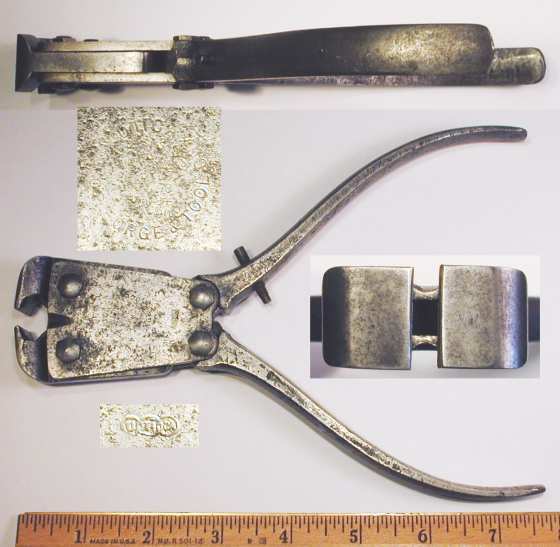 3] Hall's Patent Compound Leverage Nippers, with Insets for Side View, Jaw, and Marking Detail, ca. 1895-1910. Fig. 2 shows an early pair of Utica [No. 3] Hall's Patent compound-leverage nippers, stamped on the face with "Utica Drop Forge & Tool Co." arranged in a circle, with the 3-Ovals logo stamped below. The overall length is 8.1 inches with the handles closed. The finish is plain steel, with extensive pitting due to rust. The pliers are also marked with four patent dates, although the markings are only partially legible due to pitting. By reference to a later version of the tool, the patent dates are listed as "May, 67", "Nov. 78", "Feb. 84", and "Jan. 90". The first patent date refers to patent #64,664, filed by T.G. Hall in 1866 and issued in 1867. The second patent date refers to patent #209,677, filed by T.G. Hall in 1878 and issued later that year. The third patent date refers to patent #294,034, filed by T.G. Hall in 1883 and issued in 1884. The final patent date refers to patent #419,666, filed by T.G. Hall in 1881, but not issued until 1890. 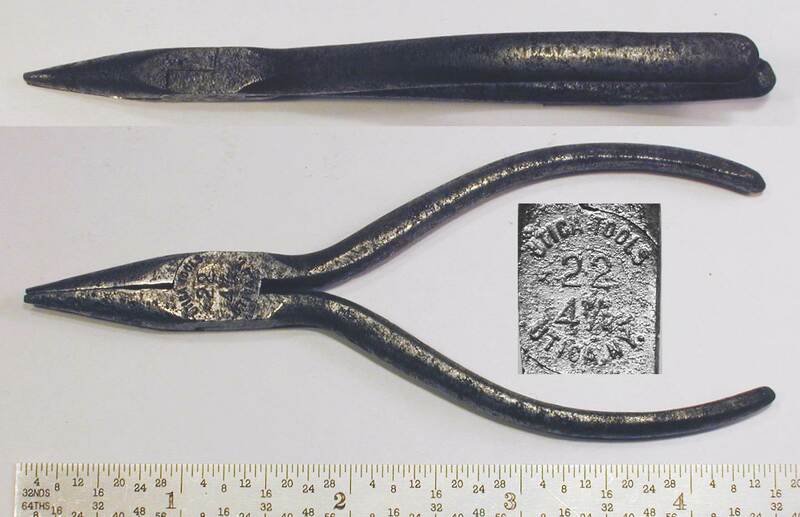 The next two figures show early examples of Utica's Russell Patent pliers, with minor differences in the markings. Fig. 3. Utica Russell Patent Staple Pulling Pliers, with Insets for Side View, Jaw, and Marking Detail, ca. 1901-1904. Fig. 3 shows an early pair of Utica 10 inch staple-pulling pliers based on the Russell patents. The pliers are stamped "U.D.F. & T. Co." and "Utica, N.Y. U.S.A." near the pivot, and with the early 3-Ovals logo stamped on the lower handle (see lower right inset). The reverse is stamped with a patent notice "Pat. June 14, 92 Sept. 3, 1895" near the pivot, shown as a close-up in the middle right inset. The overall length is 10.0 inches, and the finish is plain steel. The first patent date refers to patent #477,005, filed by J. Heard in 1891 and later licensed by the Russell Hardware and Implement Company. The second patent date refers to patent #545,537, filed by A.H. Russell in 1895. These two patents are collectively the "Russell Patents" licensed by Utica in their contract with the Russell company. Fig. 4. Utica Russell Patent Staple Pulling Pliers, with Insets for Side View, Jaw, and Marking Detail, ca. 1901-1904. The overall length is 10.1 inches, and the finish is plain steel. The patent dates refer to patents #477,005 and #545,537 respectively, as noted in the previous figure. Both patents were acquired by the Russell Hardware and Implement Company and licensed to Utica. Button's Pattern pliers were a style of wire-cutters first introduced by J.M. King & Company in the late 1860s. 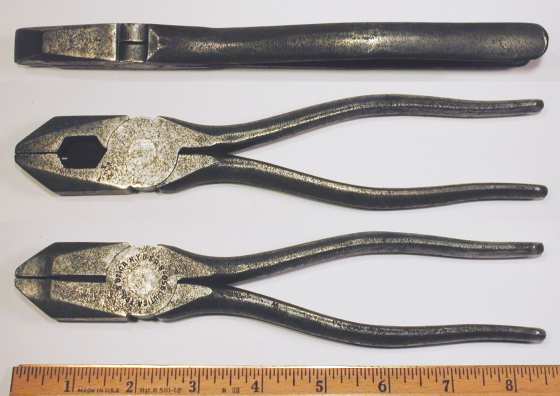 These pliers were typically produced with two or three wire-cutting slots situated at the sides or between the jaws. Button's pliers were very popular during the 19th century and were probably among the earliest tools produced by Utica. Fig. 5. Utica Early 6 Inch Button's Pattern Pliers, with Insets for Side View and Construction Detail, ca. 1901-1905. Fig. 5 shows an early pair of Utica 6 inch Button's Pattern wire-cutting pliers, stamped "U.D.F.&T.Co." and "Utica, N.Y. U.S.A." on the upper handle, with the 3-Ovals logo on the lower handle. The overall length is 6.3 inches, and the finish is plain steel. The pliers are made of high-carbon steel with the head and jaws hardened. The 3-Ovals marking on these pliers suggests a slightly later production date. This logo appears in advertisements as early as 1901, but was not marked on other examples of early Button's pliers. The next two figures show early Utica Button's pliers in the 8 inch size. Fig. 6. Utica Early 8 Inch Button's Pattern Pliers, with Insets for Side View and Construction Detail, ca. 1895-1901. Fig. 6 shows a very early pair of Utica 8 inch Button's pattern wire-cutting pliers, stamped "U.D.F.&T.Co." and "Utica, N.Y. U.S.A." on the lower handle. The overall length is 8.0 inches, and the finish is plain steel. The pliers are made of high-carbon steel with the head and jaws hardened. The middle left inset shows a close-up of the jaws, illustrating the angled cutting slot between the jaws. 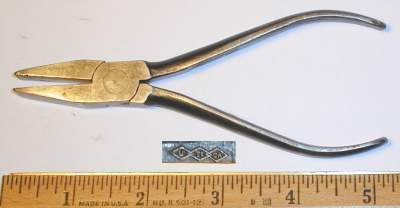 This was typical of early Utica Button's pliers. The middle right inset shows the underside of the handles, with the parting line from the forging dies clearly visible. The rough finish of the handles suggests an early production date. These pliers are not marked with the Utica 3-Ovals logo, suggesting an earlier production date. Fig. 7. Utica Early 8 Inch Button's Pattern Pliers, with Insets for Side View and Construction Detail, ca. 1895-1901. Fig. 7 shows another very early pair of Utica 8 inch Button's Pattern wire-cutting pliers, stamped "U.D.F.&T.Co." and "Utica, N.Y. U.S.A." on the lower handle. The overall length is 8.0 inches, and the finish is plain steel, with extensive pitting due to rust. By 1906 Utica had introduced a significant improvement to the Button's style by splitting the cutting slot between the jaws into two angled slots, so that the improved pliers offered four cutting slots. This design became the well-known Utica No. 1000 "Giant" Button's Pliers. The provision for two slots between the jaws is described by the 1909 Kellemen patent #942,504. Although the 1909 Kellemen patent wasn't filed until early in 1909, Utica was definitely producing the improved pliers as early as 1906. These pliers can be seen as the "Giant Buttons Pliers" in the 1906 Utica Advertisement shown earlier in this article. A careful look at that illustration shows a patent applied notice on the underside of the handles, suggesting that the Kellemen patent may have been filed earlier and rejected, then revised and filed successfully in 1909. Fig. 8. Utica Early [No. 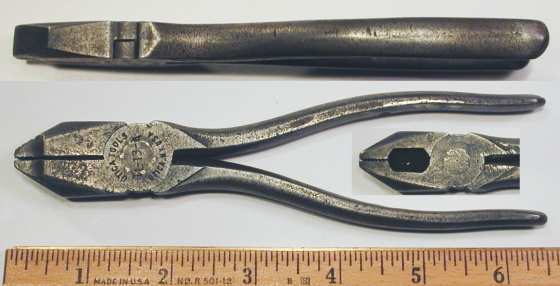 1000-8] 8 Inch "Giant" Button's Pattern Pliers, with Insets for Side View, Construction, and Marking Details, ca. 1906-1909. Fig. 8 shows an early pair of Utica [No. 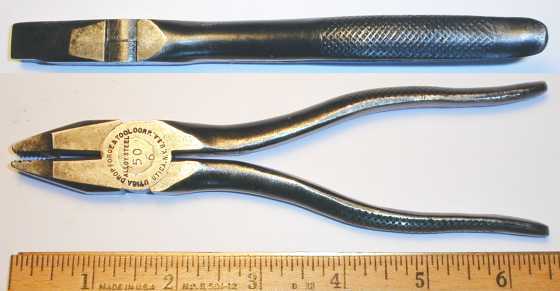 1000-8] 8 inch "Giant" Button's Pattern pliers, stamped with an early 3-Ovals logo on the face, with "Pat. Apd For" and "Giant" plus the 3-Ovals logo forged into the underside of the handles. The overall length is 8.4 inches, and the finish is plain steel. Although not marked with a model number, these pliers match the illustration of the No. 1000 "Giant Buttons Pliers" in the 1906 Utica Advertisement shown earlier in this article. The patent pending status refers to patent #942,504, filed by H.F. Kellemen in 1909 and issued later that year. The patent describes that two angled slots between the jaws (see middle left inset), which allow the pliers to grasp the piece of wire after cutting it. Fig. 9. Utica Early [No. 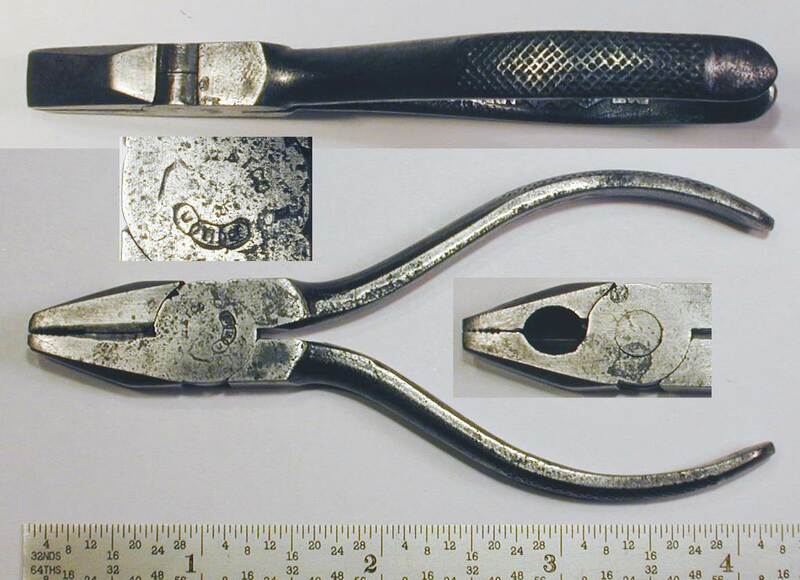 1000-10] 10 Inch "Giant" Button's Pattern Pliers, with Insets for Side View, Construction, and Marking Details, ca. 1906-1909. The overall length is 10.4 inches, and the finish is plain steel. These pliers are described by the Kellemen 1909 patent #942,504, and the patent applied notice on the underside may refer to this patent. The patent describes the two angled cutting slots between the jaws (see middle left inset), which allow the pliers to grasp a piece of wire after cutting it. The next two figures show early examples of the Utica 1000 pliers in the 6 inch size. Fig. 10. Utica Early [No. 1000-6] 6 Inch "Giant" Button's Pattern Pliers, with Insets for Side View, Construction, and Marking Details, ca. 1906-1909. Fig. 10 shows an early pair of Utica [No. 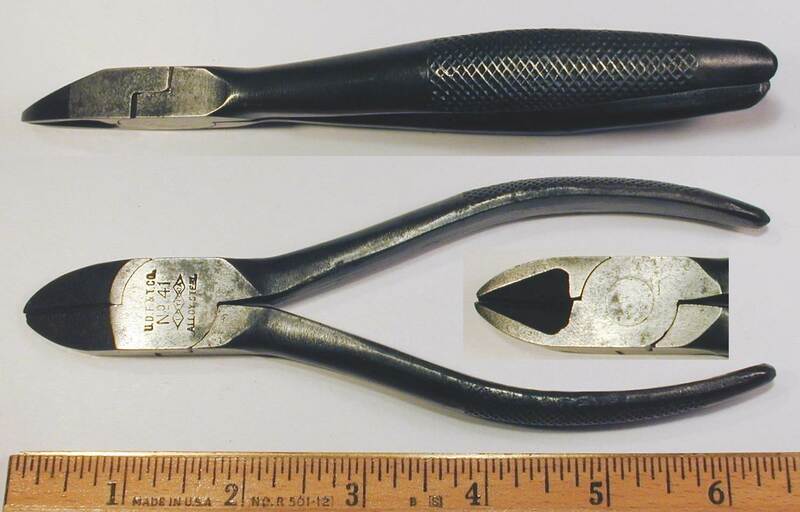 1000-6] 6 inch "Giant" Button's Pattern wire-cutting pliers, marked with "Pat. Apd For" and "Giant" plus the 3-Ovals logo forged into the underside of the handles (see lower inset). The overall length is 6.1 inches, and the finish is plain steel. The patent pending status refers to patent #942,504, filed by H.F. Kellemen in 1909 and issued later that year. 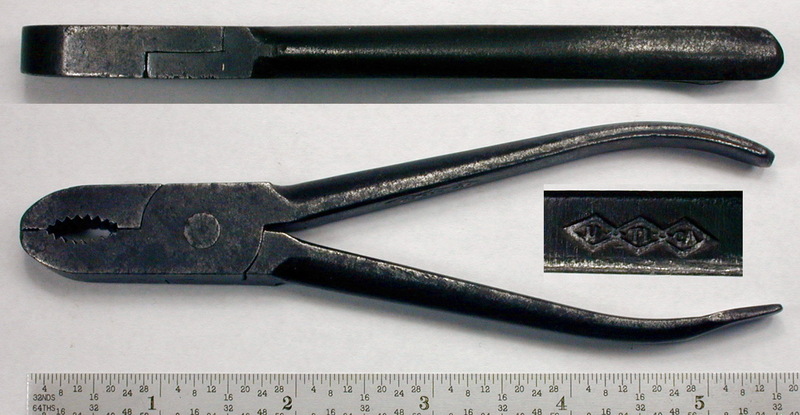 The patent describes that two angled slots between the jaws (see middle inset), which allow the pliers to grasp the piece of wire after cutting it. Fig. 11. Utica Early [No. 1000] 6 Inch Button's Pattern Pliers, with Inset for Side View, ca. 1906-1909. Fig. 11 shows another early pair of Utica [No. 1000-6] 6 inch Button's Pattern wire-cutting pliers. The pliers are very worn from extensive use, making the markings difficult to read, but were originally stamped "U.D.F.&T. Co." with "Pat. App. For" across the pivot. The overall length is 6.2 inches, and the finish is plain steel. The pliers are made of high-carbon steel with the head and jaws hardened. The patent pending status is refers to patent #942,504, filed by H.F. Kellemen in 1909 and issued later that year. The patent notes that the angled slot opening into the jaws was intended to allow the pliers to grasp the piece of wire after cutting it. Lineman's pliers are an important style of side-cutting pliers, with the name based on their widespread usage among telephone and electric utility line workers. In the years before 1910, Utica was offering at least three lines of lineman's pliers, the No. 50 basic model, the No. 1950 heavy-duty pliers, and the No. 1650 box-joint pliers. Fig. 12. Utica Early [No. 50] 8 Inch Lineman's Pliers, with Inset for Side View, ca. 1905-1910. Fig. 12 shows a very early pair of Utica [No. 50] 8 inch lineman's pliers, stamped with an early 3-Ovals logo resembling interlocked chain links. The overall length is 8.1 inches, and the finish is black oxide. The use of the "3-Ovals" logo suggests production before 1910, probably in the range 1905-1910. Button's Pattern pliers were a style of wire-cutters first introduced by J.M. King & Company in the late 1860s. These pliers were typically produced with two or three wire-cutting slots situated at the sides or between the jaws. Button's pliers were very popular during the 19th century and remained in production through at least the mid 20th century. 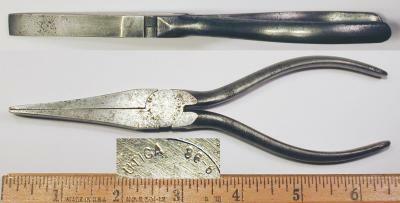 Utica began producing Button's Pattern pliers at an early stage, and examples can be seen in the section on Early Button's Pliers. Fig. 13. Utica 3000 6 Inch Button's Pliers with Stop, with Insets for Side View and Construction Detail, ca. 1910-1912. Fig. 13 shows an early pair of Utica 3000 6 inch Button's pliers with built-in opening stops to align the cutting slots. The pliers are stamped with the model and 3-Diamonds logo across the pivot, and each handle has a 3-Diamonds logo forged into the underside (see lower inset). The overall length is 6.5 inches, and the finish is plain steel. The left middle inset shows the jaw opening to illustrate the two angled cutting slots placed between the jaws. The provision for two slots between the jaws was a Utica innovation and is described by the 1909 Kellemen patent #942,504. The plain non-patterned handles suggest production before 1913, when Utica began producing patterned handles for most models. The most distinctive design feature of these pliers are the raised ridges used to limit the opening, such that the cutting slots are brought into perfect alignment. The ridges can be seen in the side view of the pliers (top inset), visible on either side of the cutting slots. This feature has not been seen previously on any Utica pliers, although no patent is known for the design. Fig. 14. Utica 1000-8 Giant Button's Pliers, with Inset for Side View, ca. 1944-1959. Fig. 14 shows a pair of Utica 1000-8 wire-cutting pliers, referred to as the "Giant Button's Pliers" in the catalogs. The pliers are marked "Utica Tools" and "Utica, N.Y. U.S.A." across the pivot. The 1939 Utica catalog listed pliers of this model in sizes 4-1/2, 6, 8, and 10 inches, but by 1952 the No. 1000 model was available only in 8 and 10 inch sizes. The slightly bowed handles of the present example match the illustration in the 1952 catalog. Fig. 15. Utica 1000-10 Giant Button's Pliers, with Inset for Side View, ca. 1950. Fig. 15 shows a pair of Utica 1000-10 wire-cutting pliers, referred to as the "Giant Button's Pliers" in the catalogs. The pliers are marked "Utica Tools" and "Utica, N.Y. U.S.A." around the pivot, with a "Pat.App. For" patent notice across the bottom. The overall length is 10.5 inches, and the finish is plain steel. The patent corresponding to the pending notice on the tool is not yet known. 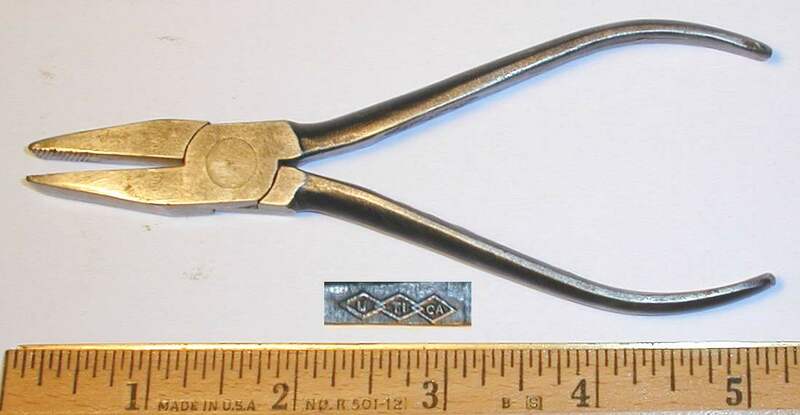 An earlier version of this pliers can be seen as the Utica Early [1000-10] Button's Pliers. An example of a similar model from another maker can be seen as the Kraeuter 1841-8 Button's Pliers. Fencing or staple-pulling pliers frequently included Button's style cutters on the sides, as the next figure illustrates. Fig. 16. Utica No. 29 Fencing Pliers, with Insets for Side View and Jaw Detail. Fig. 16 shows a pair of Utica No. 29 fencing pliers with staple-pulling jaws and Button's cutting slots, marked with just the Utica name and model. The overall length is 10.4 inches, and the finish is black oxide. These pliers are made of high-carbon steel, and the head and jaws are hardened to the point that a file merely bounces off. In this design the flats on either side of the head are intended for use as a hammer. 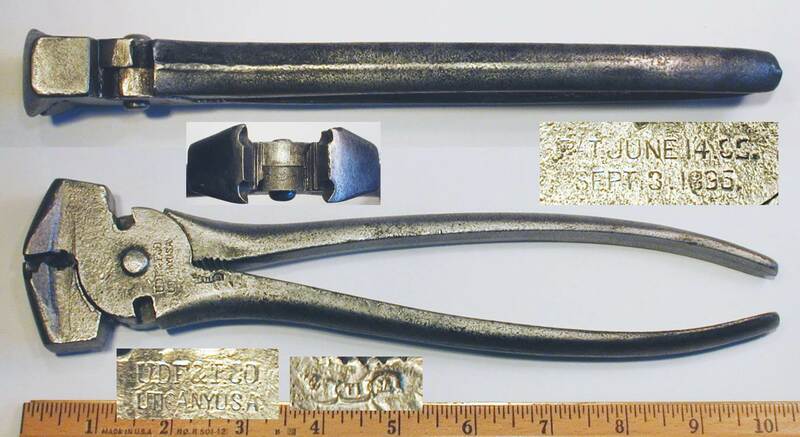 Although not marked with a patent notice, these pliers appear to be covered by patent #794,064, issued to H.L. White in 1905. No catalog reference for this model has been found, although the Utica catalogs do list similar pliers with different model numbers. The simple markings (without even the 3-Diamonds logo) suggest that this may be a very early example of Utica's production. Fig. 17. Utica No. 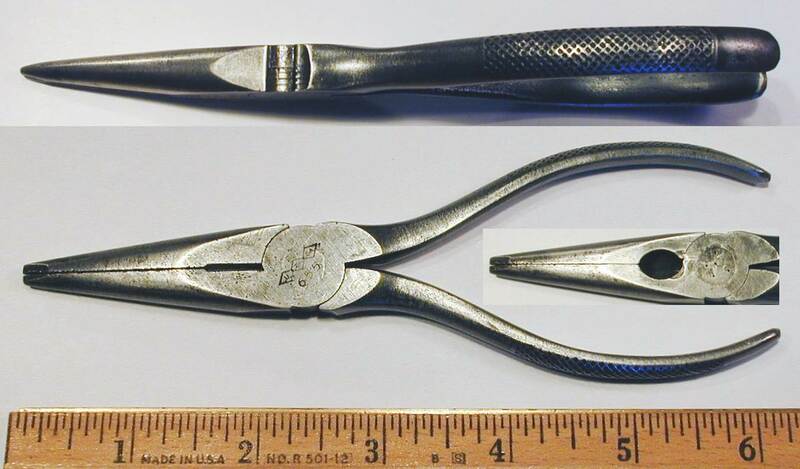 2001-8 8 Inch Side Cutting Pattern Button's Pliers, with Inset for Side View, ca. 1944-1945. Fig. 16 shows a pair of Utica No. 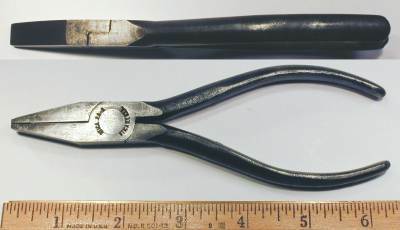 2001-8 8 inch cutting pliers, referred to as "Side Cutting Pattern Button's Pliers" in the 1939 Utica catalog. The pliers are stamped "Utica Tools" and "Utica, N.Y. U.S.A." around the pivot, with the model number stamped (faintly) across the center. The overall length is 8.4 inches, and the finish is black oxide. The face of these pliers has only roughly finished, suggesting a wartime production date. With the "Utica Tools" marking, the production was likely in 1944-1945. Fig. 18. Utica  10 Inch Button's Pattern Pliers, with Insets for Side View and Jaw Detail, ca. 1940s. Fig. 18 shows a pair of Utica  10 inch "Competition" Button's Pattern pliers with two cutting slots, marked only with the 3-Diamonds logo forged into the underside of the handles. 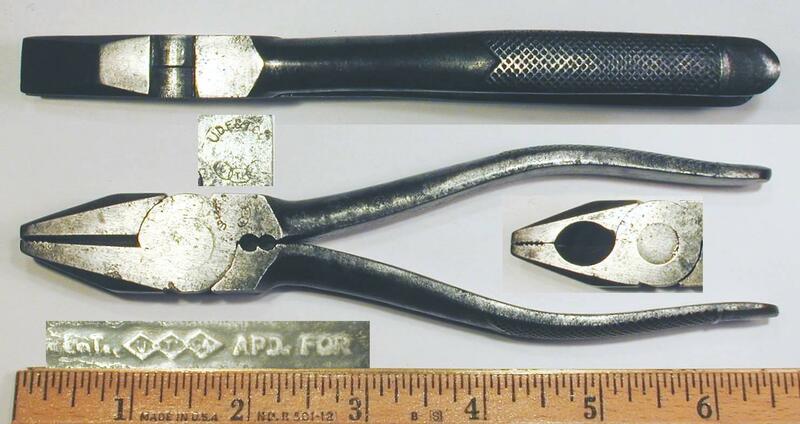 Although not marked with a model number, these pliers were identified as the No. 300 "Competition Button's Pliers" by an illustration in Utica's No. 57 price sheet from 1941. (The reference to "competition" in this context generally meant a lower selling price.) The No. 300 pliers were available in 6, 8, and 10 inch nominal sizes. Fig. 19. Utica [HS-180] 10 Inch Button's Pattern Pliers, with Insets for Side View and Jaw Detail, ca. 1942-1945. Fig. 19 shows a pair of Utica [HS-180] 10 inch Button's Pattern pliers with three cutting slots, stamped "Utica" and "N.Y." with the 3-Diamonds logo in the center. The middle inset provides a close-up of the jaws, showing the center cutting slot set at an angle to the faces. 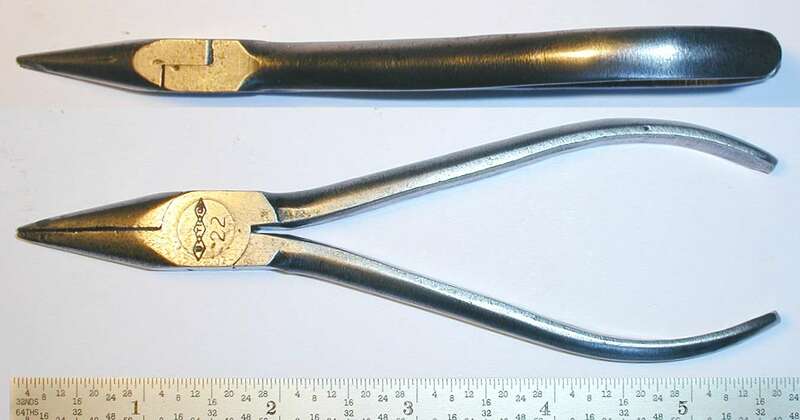 Note that these pliers are made in the original Button's Pattern style, with a single cutting slot between the jaws, rather than the two slots of Utica's improved design. Although not marked with a model number, these pliers were identified as model HS-180 by an illustration in Utica's No. 57 price sheet from 1941. This model is referred to as "Button's Pliers for Wire and Steel Mills" in the catalogs, and was available from the early 1940s (or before) up to at least the mid 1950s. The HS-180 pliers were available only in the 10 inch size. The rough finish on the pliers and somewhat non-standard markings suggest production during the 1942-1945 wartime years. Lineman's pliers are an important subcategory of fixed-pivot pliers characterized by wide blunt-nose jaws and strong side-cutting edges near the pivot. 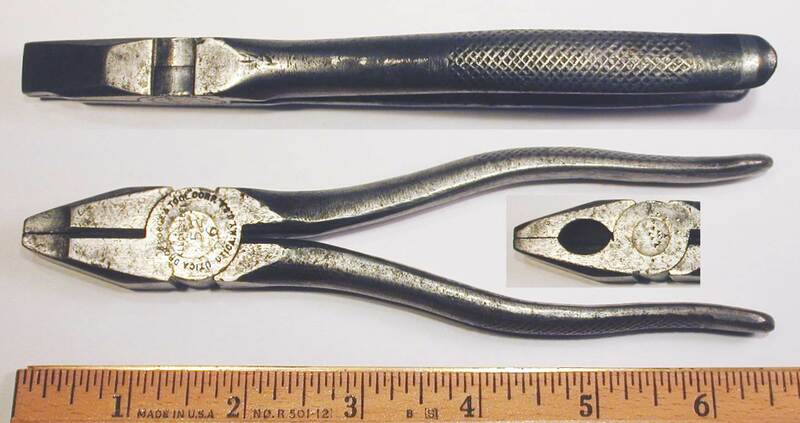 As the name implies, these pliers were widely used by telephone and electric utility line workers. In addition to the classic lineman's pliers models No. 50, No. 1050, and No. 1950, Utica also produced side-cutting pliers resembling the lineman's design, but with the addition of other features such as rounded gripping surfaces, Button's style cutters, or screwdriver blades on the handle tips. We have included some examples of these "Lineman's Combination" models in this section. The No. 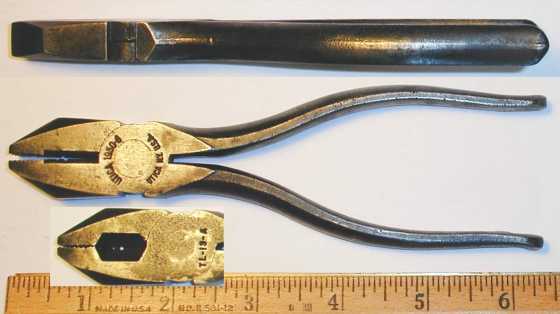 50 series of side-cutting lineman's pliers was one of Utica's more popular patterns and remained in production for many years. These pliers were produced in nominal sizes of 4, 5, 6, 7, and 8 inch lengths. We'll begin with an early 4 inch example, the smallest model of this product line. Fig. 20. Utica [No. 50-4] 4 Inch Lineman's Pliers, with Insets for Side View, Construction, and Marking Detail, ca. 1912-1913. Fig. 20 shows an early pair of Utica [No. 50-4] 4 inch lineman's (side-cutting) pliers, stamped "? ?F & T. Co." with the 3-Ovals logo on the face (see middle inset), with "Pat Apd For" and the 3-Diamonds logo forged into the underside of the handles (not shown). The overall length is 4.2 inches. The finish is plain steel, with some pitting due to rust. These pliers have a diamond checkered gripping pattern on the handles, a feature introduced around 1913. The presence of both the 3-Ovals and 3-Diamonds logo indicates that this is a transitional example of Utica's production, probably from 1910 to about 1913. The diamond checkered gripping pattern on the handles further narrows the production to around 1912-1913. The diminutive size of these pliers would not normally be associated with the name "Lineman's Pliers", but the head design closely resembles the larger No. 50 pliers shown in the later figures. The bow handles on these pliers are more suitable for pliers in smaller sizes. Fig. 21. Utica [No. 50-5] 5 Inch Lineman's Pliers, with Insets for Handle Pattern and Marking Detail, ca. 1913-1920. Fig. 21 shows an early pair of Utica [No. 50-5] 5 inch lineman's pliers, marked with the 3-Diamonds logo and "Pat Apd For" forged into the underside of the handles. The overall length is 5.0 inches, and the finish is plain steel. These pliers are not marked with a model number, but closely resemble the No. 50 pliers shown in several later figures. The bow handles on these pliers are more suitable for pliers in smaller sizes. The patent corresponding to the pending notice marked on the tool has not yet been found, but may refer to the distinctive checkered handle design. Other examples of pliers with this patent applied marking include the Early 1300-7 Gas and Burner Pliers and Early Slip-Joint Combination Pliers, and these examples also show a similar handle pattern. The next several figures show multiple generations of the No. 50 pliers in the popular 6 inch size. Fig. 22. Utica [No. 50-6] 6 Inch Lineman's Pliers, with Insets for Side View and Reverse Detail, ca. 1912-1913. Fig. 22 shows an early pair of Utica [No. 50-6] 6 inch lineman's pliers, stamped with "U.D.F. & T. Co." and the 3-Ovals logo on the face (see middle inset). The pliers are also marked with "Pat. Apd. For" and the 3-Diamonds logo forged into the underside of the handles, shown as a close-up in the lower inset. The overall length is 6.4 inches, and the finish is black oxide. Fig. 23. Utica Early [No. 50-6] 6 Inch Lineman's Pliers, with Insets for Handle Pattern and Marking Detail, ca. 1913-1920. The overall length is 6.4 inches, and the finish is plain steel. Fig. 24. Utica No. 50 6 Inch Lineman's Pliers, with Inset for Handle Pattern, ca. 1920s. Fig. 24 shows a somewhat later pair of Utica No. 50 6 inch lineman's pliers, stamped with the 3-Diamonds logo and model number across the pivot. The overall length is 6.3 inches, and the finish is black oxide. The handles of these pliers have a diamond checkered gripping pattern with squared-off ends, a later variant of Utica's handle patterns. Fig. 25. Utica No. 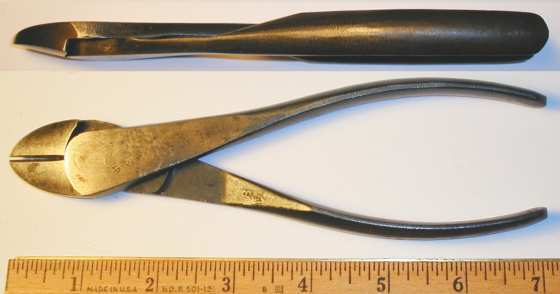 50 6 Inch Lineman's Pliers, with Inset for Side View, ca. 1930s to Early 1940s. The "Alloy Steel" marking indicates a likely production date in the 1930s to early 1940s. Fig. 26. Utica No. 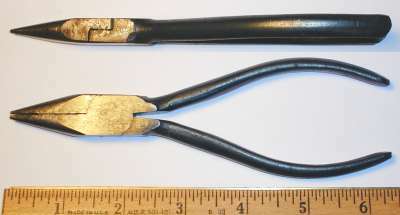 50-6 6 Inch Lineman's Pliers, with Inset for Side View, ca. 1930s to Early 1940s. Fig. 26 shows another later pair of Utica 50-6 6 inch lineman's pliers, marked "Utica Drop Forge & Tool Co." and "Utica, N.Y. U.S.A." around the pivot, with "Alloy Steel" across the pivot. The overall length is 6.5 inches, and the finish is black oxide. Fig. 27. Utica 50-7 7 Inch Lineman's Pliers, ca. 1944-1960. Fig. 27 shows an example of the later production of model 50 series, a pair of Utica 50-7 7 inch lineman's pliers, marked "Utica Tools" and "Utica, N.Y. USA" near the pivot. The overall length is 7.3 inches, and the finish is black oxide. The handles of these pliers are plain, without the cross-hatched grip pattern seen on earlier production. The next figures show several generations of the Utica No. 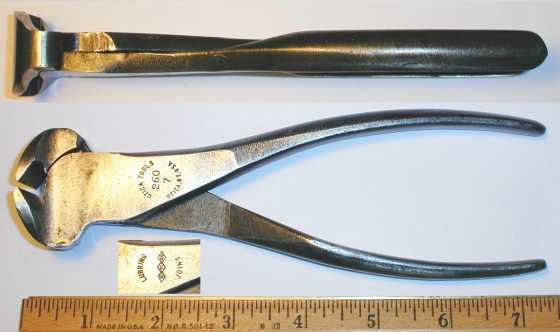 50 8 inch lineman's pliers, beginning with a relatively early example. Fig. 28. Utica No. 50 8 Inch Lineman's Pliers, with Insets for Side View and Reverse Detail, ca. 1920s. Fig. 28 shows a fairly early pair of Utica No. 50 8 inch lineman's pliers, stamped with the model number and the 3-Diamonds logo. The overall length is 8.2 inches, and the finish is black oxide. Fig. 29. Utica No. 50-8 8 Inch Lineman's Pliers, with Inset for Handle Pattern, ca. 1930-1943. Fig. 29 shows a later pair of Utica No. 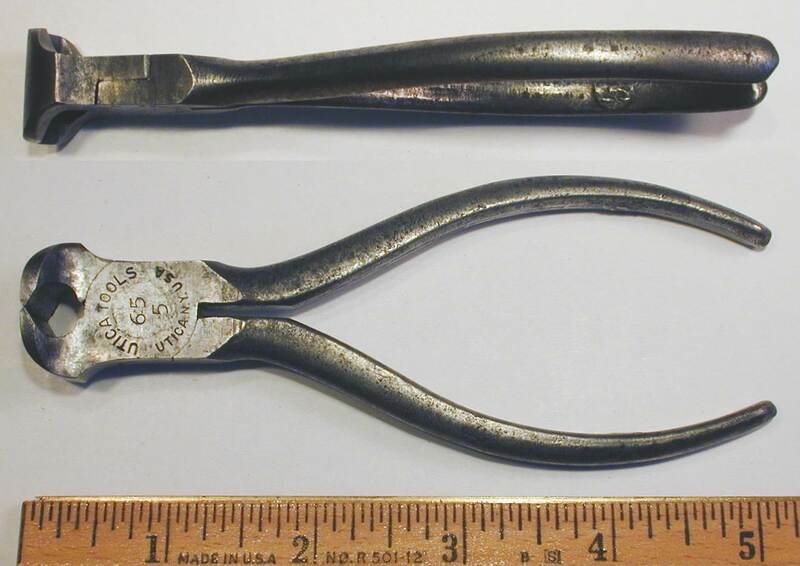 50-8 lineman's pliers, marked "Utica Drop Forge & Tool Co." and "Utica, N.Y. U.S.A.", with "Alloy Steel" on the reverse. The "Alloy Steel" marking likely indicates production in the 1930s to early 1940s. Fig. 30. Utica No. 50-8 8 Inch Lineman's Pliers, with Insets for Side View and Reverse Detail, ca. 1944-1960. Fig. 30 shows a later pair of Utica No. 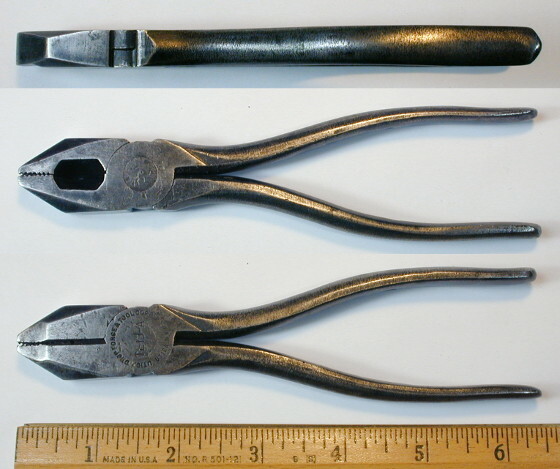 50-8 8 inch lineman's pliers, stamped "Utica Tools" and "Utica N.Y. U.S.A." around the pivot. The overall length is 8.1 inches. The finish is plain steel, with pitting due to rust. Fig. 31. Utica No. 50-8 8 Inch Lineman's Pliers, with Insets for Side View and Reverse Detail, ca. 1944-1960. Fig. 31 shows another later pair of Utica No. 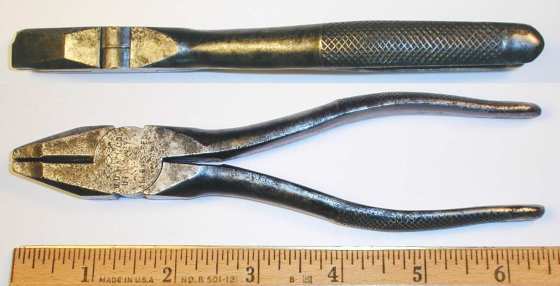 50-8 lineman's pliers with slightly different markings. The pliers are stamped "Utica Tools" and "Utica, N.Y. USA" around the pivot, with the model number in the center. The overall length is 8.1 inches, and the finish is plain steel. 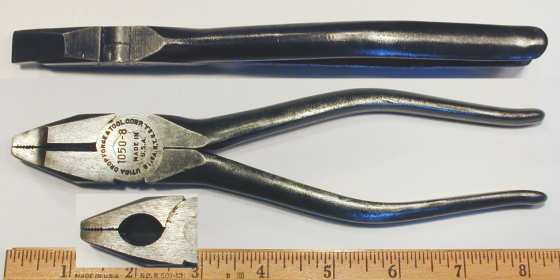 The Utica 1050 series of lineman's pliers was very similar to the 50 series, but produced with plain handles and a slightly less expensive finish. The next two figures show examples of the 1050 model series. Fig. 32. Utica 1050[-8] 8 Inch Lineman's Pliers, with Insets for Side View and Reverse Detail, ca. 1920s. Fig. 32 shows an earlier pair of Utica 1050[-8] 8 inch lineman's pliers, stamped with the model number and 3-Diamonds logo near the pivot. The overall length is 8.2 inches. The finish is plain steel with extensive pitting due to rust. Fig. 33. Utica 1050-8 Lineman's Pliers, with Insets for Side View and Reverse Detail, ca. 1925-1943. Fig. 33 shows a somewhat later pair of Utica 1050-8 lineman's pliers, stamped "Utica Drop Forge & Tool Corp." and "Utica, N.Y. U.S.A." around the pivot, with the model number and "Made in U.S.A." across the center. Fig. 34. Utica 52-6 Closed-Nose Side-Cutting (Lineman's) Pliers, with Insets for Side View and Reverse Detail, ca. Early 1940s. Fig. 34 shows a pair of Utica 52-6 6 inch closed-nose side-cutting pliers, very similar to the model 50 lineman's pliers. The pliers are marked "Utica Drop Forge & Tool Corp." and "Utica, N.Y. U.S.A." around the pivot, with "Alloy Steel" and the model number across the center. Our only catalog reference for this model is the No. 57 price list of 1941, which lists these as "Side Cutting Closed Nose Fine Checked Jaw Pliers - Alloy Steel". The main difference from the model 50 lineman's pliers is that the jaws close tightly on the checkered gripping section at the nose. Fig. 35. Early Utica 8 Inch Lineman's Pliers, with Insets for Side View and Construction Detail, ca. 1913-1920. Fig. 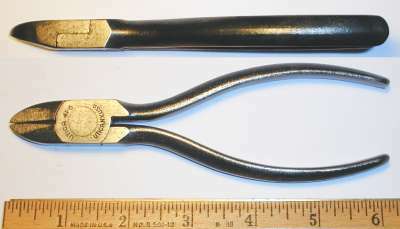 35 shows a pair of early Utica 8 inch lineman's pliers with a slightly rounded head, marked only with the 3-Diamonds logo on the underside of one handle (see middle inset). The model number for this example is not yet known. The upper inset shows a side view of the pliers to illustrate the head shape and handle pattern. The lower inset shows the semicircular openings behind the side cutters. Fig. 36. Utica No. 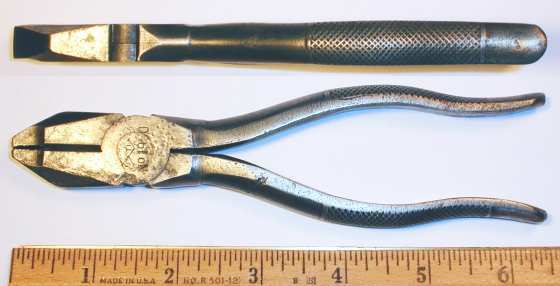 1950 6 Inch Heavy-Duty Lineman's Pliers, with Inset for Side View. Fig. 36 shows an early pair of Utica No. 1950 6 inch heavy-duty lineman's pliers, stamped with the 3-Diamonds logo across the pivot. The Utica model 1950-6 pliers were also produced for military contracts as the model TL-13-A pliers. The next several figures show examples of this model. Fig. 37A. Utica TL-13-A 6 Inch Heavy-Duty Lineman's Pliers, with Insets for Reverse and Side View, ca. 1930s to Early 1940s. Fig. 37A shows an earlier pair of Utica TL-13-A 6 inch heavy-duty lineman's pliers, stamped "Utica Drop Forge & Tool Corp." and "Utica N.Y. U.S.A." around the pivot, with "TL-13-A" across the center. 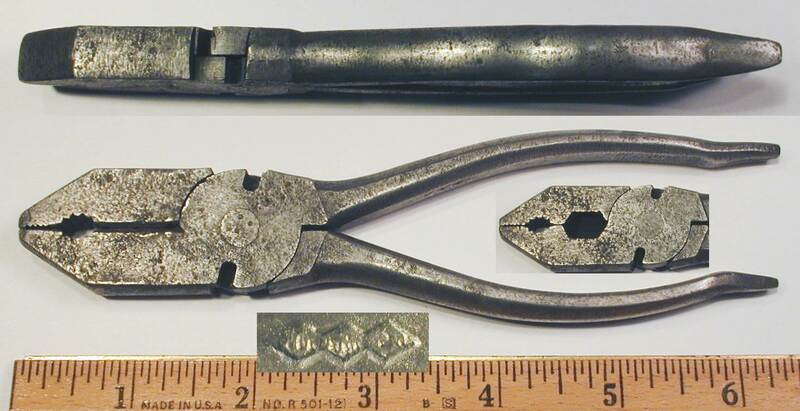 According to one of our readers, the "TL-13-A" marking is a model number for the U.S. Signal Corps, indicating that these pliers were made for a military contract. This suggests that there may be other TL-series numbers, and we'll try to locate additional information on this. A close look at the cutter jaws shows two nicely rounded holes, designed for stripping wire of the more commonly used gauges. Fig. 37B. Utica 1950-6/TL-13-A 6 Inch Heavy-Duty Lineman's Pliers, with Insets for Side View and Reverse Detail, ca. 1944-1960. Fig. 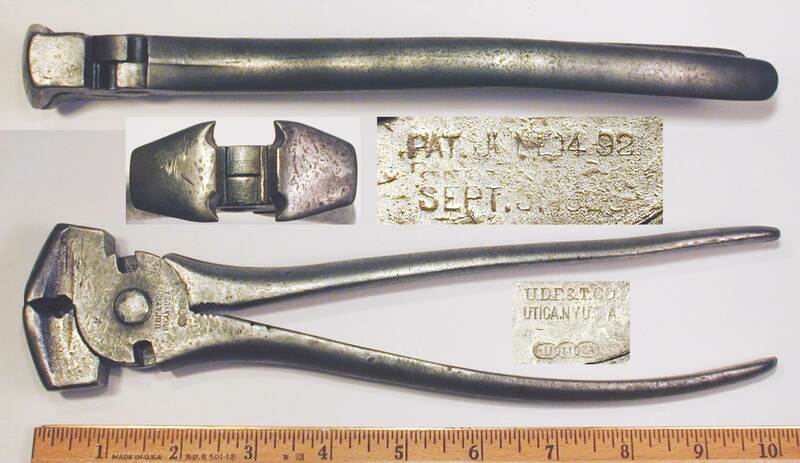 37B shows a later pair of Utica 1950-6/TL-13-A 6 inch heavy-duty lineman's pliers, stamped "Utica 1950-6" and "Utica N.Y. U.S.A." around the pivot, with "TL-13-A" stamped on the reverse. Fig. 38. Utica TL-13-A 6 Inch Heavy-Duty Lineman's Pliers, with Insets for Side View and Reverse Detail, ca. 1944-1960. Fig. 38 shows another pair of Utica TL-13-A [1950-6] 6 inch heavy-duty lineman's pliers, marked "Utica Tools" and "Utica N.Y. U.S.A." around the pivot, with "TL-13-A" stamped across the pivot. The overall length is 6.4 inches, and the finish is plain steel, with pitting due to rust. As with the previous example, the cutting edges have two nicely rounded holes for stripping wire. 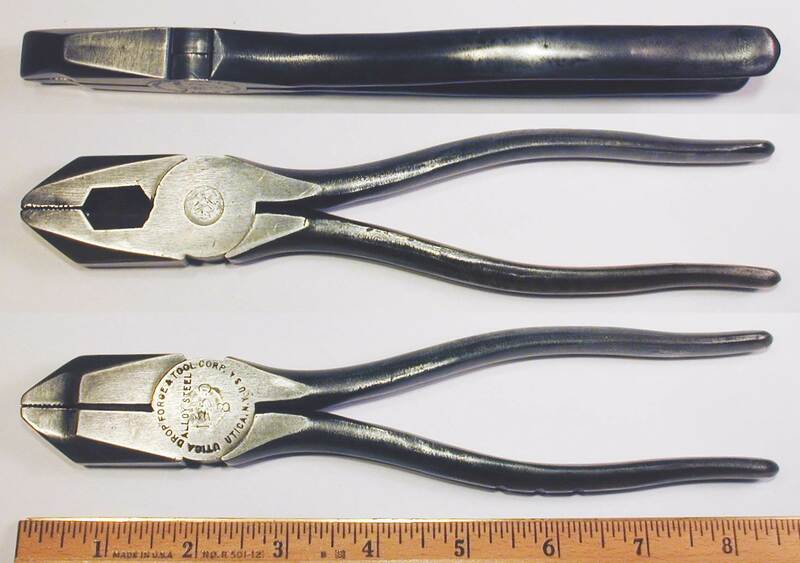 The next figures show three generations of the 1950-8 lineman's pliers. Fig. 39. Utica Early [No. 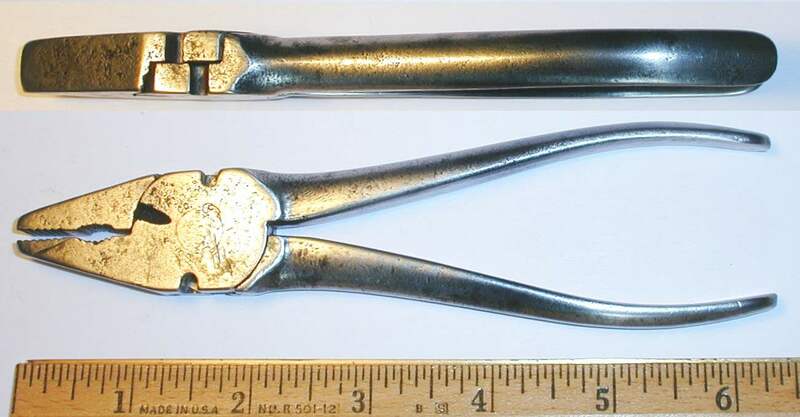 1950-8] 8 Inch Lineman's Pliers, with Insets for Side View and Detail, ca. 1913-1920. Fig. 39 shows an earlier pair of Utica [No. 1950-8] 8 inch lineman's pliers, marked only with the 3-Diamonds logo on the underside of one handle (see middle inset). The overall length is 8.5 inches, and the finish is black oxide. 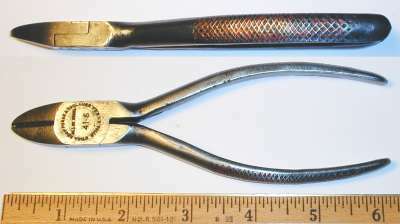 The upper inset shows a side view of the pliers to illustrate the head shape and diamond checkered gripping pattern on the handles. The lower inset shows the hexagonal opening in back of the side cutters. Although not marked with a model number, the head shape and heavy construction identify this as the No. 1950 lineman's pliers. Fig. 40. Utica 1950-8 8 Inch Lineman's Pliers, with Insets for Side View and Detail, ca. Early to Mid 1940s. Fig. 40 shows a somewhat later pair of Utica 1950-8 8 inch lineman's pliers, stamped "Utica Drop Forge & Tool Corp." and "Utica, N.Y. U.S.A." around the pivot, with "Alloy Steel" and the model number across the center. The upper inset illustrates the smooth handles on these pliers, without the gripping pattern found on earlier versions of this model. The smooth handles and "Alloy Steel" marking suggest production in the early to mid 1940s. Fig. 41. Utica 1950-8 8 Inch Lineman's Pliers, with Insets for Side View and Detail, ca. 1944-1960. Fig. 41 shows a later pair of Utica 1950-8 8 inch lineman's pliers, stamped with "Utica Tools" and "Utica, N.Y. U.S.A." around the pivot. The overall length is 8.4 inches, and the finish is plain steel, with extensive pitting due to rust. Fig. 42A. Utica 2050[-6] 6 Inch Box-Joint Lineman's Pliers, with Insets for Side View and Reverse Detail, ca. 1920s. Fig. 42A shows a pair of Utica 2050[-6] 6 inch box-joint lineman's pliers, stamped with the model number and 3-Diamonds logo near the pivot, and with the 3-Diamonds logo forged into the underside of the handles. The top inset shows a side view of the pliers, illustrating the box-joint construction and diamond checkered gripping pattern. Fig. 42B. Utica [2050-8] 8 Inch Box-Joint Lineman's Pliers, with Insets for Side View and Reverse Detail, ca. 1913-1920. Fig. 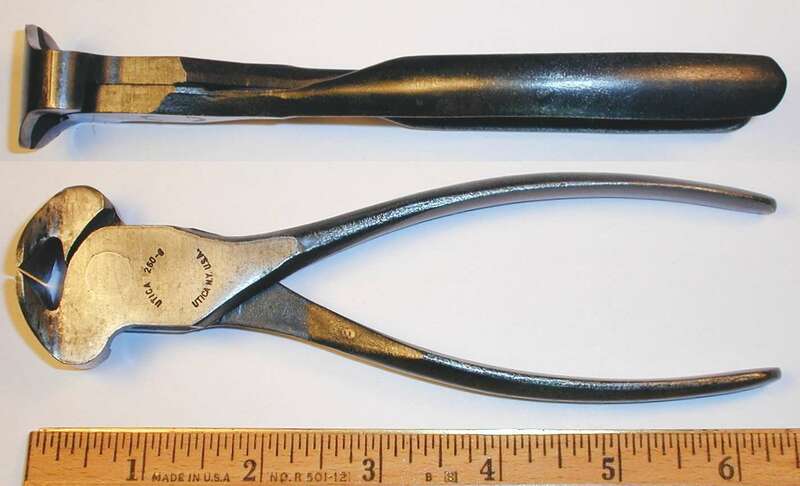 42B shows a pair of Utica [2050-8] 8 inch box-joint lineman's pliers, marked with "Pat. Apd. For" and the 3-Diamonds logo forged into the underside of the handles. The overall length is 8.5 inches, and the finish is plain steel. The top inset shows a side view of the pliers, illustrating the box-joint construction and the diamond checkered gripping pattern with a V-shaped opening at the front. Utica introduced this gripping pattern around 1912 or 1913. Fig. 43. Utica Early No. 25 5.5 Inch Combination Flat Nose and Burner Pliers, with Insets for Side View and Reverse Detail, ca. 1912-1914. Fig. 43 shows an early pair of Utica No. 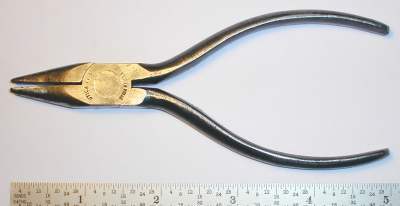 25 5.5 inch combination flat nose and burner pliers, incorporating flat and rounded gripping surfaces, side-cutters, and a tapered nose. The pliers are marked with "U.D.F.&T. Co. and the Utica 3-Ovals logo stamped on the face, with "Pat Apl For" and the 3-Diamonds logo forged into the underside of the handles. The overall length is 5.6 inches, and the finish is plain steel. The top inset illustrates the diamond checkered gripping pattern on the handles with a V-shaped opening at the front. Utica introduced this pattern around 1912 or 1913. 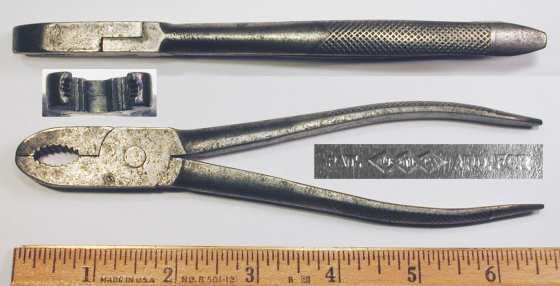 These pliers are not marked with the model number, but were identified by the illustration and description in the 1915 catalog, which shows this model under the heading "Utica Combination Flat Nose and Burner Plier". Although designed for more specific uses, this model resembles the lineman's style with the side-cutters and blunt nose. The use of both the 3-Ovals and 3-Diamonds logos with the early gripping pattern suggests transitional production around 1912-1914. Fig. 44. Utica  6 Inch "Combination" Lineman's Pliers, with Insets for Side View and Reverse Detail, ca. 1910-1913. Fig. 44 shows an early pair of Utica  6 inch "Combination" lineman's pliers, a basic side-cutting lineman's pattern with the addition of wire-cutting slots, flat and rounded gripping surfaces, and screwdriver and awl tips. The pliers are marked only with the Utica 3-Diamonds logo on the underside of the handle, but the model number was identified from early advertisements. The 3-Diamonds marking on this example indicates production sometime after late 1910. The smooth non-patterned handles on these pliers help narrow the production date, as Utica began producing patterned handles around 1913. Utica advertised this model as "universal" pliers suitable for a wide variety of jobs, and the pliers are equipped with a number of features beyond the basic lineman's design. The jaws have both flat and rounded serrated gripping surfaces, and the standard side-cutters are backed up by two Button's-pattern cutting slots. Even the handles provide additional features, as one handle offers a flat screwdriver bit while the other functions as a reamer or awl. Fig. 45. Utica 700 7 Inch "Combination" Lineman's Pliers, with Insets for Side View and Reverse Detail, ca. 1920s+. Fig. 45 shows a later pair of Utica 700 7 inch "Combination" lineman's pliers, a basic side-cutting lineman's pattern with the addition of wire-cutting slots, flat and rounded gripping surfaces, and screwdriver and awl tips. The pliers are stamped with the model number and 3-Diamonds logo near the pivot. The overall length is 7.6 inches, and the finish is plain steel. 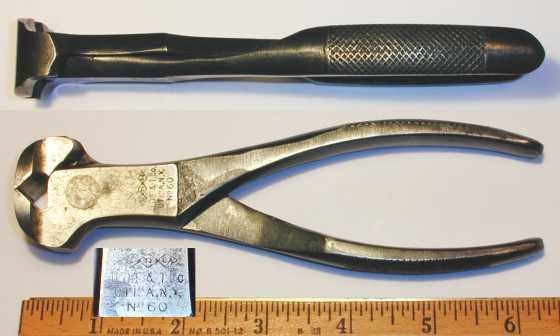 The top inset shows a side view of the pliers, illustrating the diamond checkered gripping pattern with squared-off ends, a later variant of Utica's handle patterns. Fig. 46. Utica 708 8 Inch Lineman's Combination Pliers, with Insets for Side View and Reverse Detail, ca. 1910-1913. Fig. 46 shows an early pair of Utica 708 8 inch lineman's combination (or "universal") pliers, stamped with the model number and 3-Diamonds logo near the pivot. Utica was offering the model No. 60 end nippers as early as 1906, and an advertisement from that year refers to this model as the "No. 60 Bull Dog End Cutting Nipper". Fig. 47A. Utica No. 60[-5] 5 Inch End Nippers, with Insets for Side View and Marking Detail, ca. 1918 to Early 1920s. Fig. 47A shows an early pair of Utica No. 60[-5] 5 inch end nippers, stamped with the 3-Diamonds logo and model number, and with "Apd For" and the 3-Diamonds logo forged into the underside of the handles. The overall length is 5.2 inches, and the finish is black oxide. The top inset shows a side view of the nippers, illustrating the relatively heavy construction and wide handles of these earlier nippers. Note that the handles have the early diamond checkered gripping pattern with a V-shaped opening at the front, a feature introduced in 1912 or 1913. The model number marking indicates a somewhat later production date. Fig. 47B. Utica No. 60[-6] 6 Inch End Nippers, with Insets for Side View and Marking Detail, ca. 1925-1943. Fig. 47B shows a pair of Utica No. 60 6 inch end nippers, stamped with the 3-Diamonds logo followed by "U.D.F. & T.Co." and "Utica, N.Y." plus the model number. The top inset shows the relatively heavy construction and wide handles of these earlier pliers. The handles of the pliers have a diamond checkered gripping pattern with squared-off ends, a later variant of Utica's handle patterns. Utica was offering the model No. 60 nippers as early as 1906, and an advertisement from that year refers to this model as the "No. 60 Bull Dog End Cutting Nipper". Fig. 48. Utica 60-7 7 Inch End Nippers, with Insets for Side View and Marking Detail, ca. 1925-1943. Fig. 48 shows a pair of Utica 60-7 7 inch end nippers, stamped with "Utica Drop Forge & Tool Corp." and "Utica, N.Y. U.S.A." with the model number in the center. Fig. 49. Utica 65-5 5 Inch Jeweler's End Nippers, with Inset for Side View, ca. 1944-1960. Fig. 49 shows a pair of Utica 65-5 5 inch jeweler's end nippers, stamped "Utica Tools" and "Utica, N.Y. USA" around the pivot. The overall length is 5.1 inches, and the finish is plain steel. The next several figures show examples of the Utica 260 series of end nippers, a later model utilizing a new lubricated joint. Fig. 50. Utica 260-6 End Nippers, with Inset for Side View, ca. 1948-1960. Fig. 50 at the left shows a later pair of Utica 260-6 end nippers, marked "Utica N.Y. U.S.A." near the pivot, with "Lubring" and "Patented" on the reverse. Fig. 51. Utica 260-6 End Nippers, with Insets for Side View and Marking Detail, ca. 1960+. Fig. 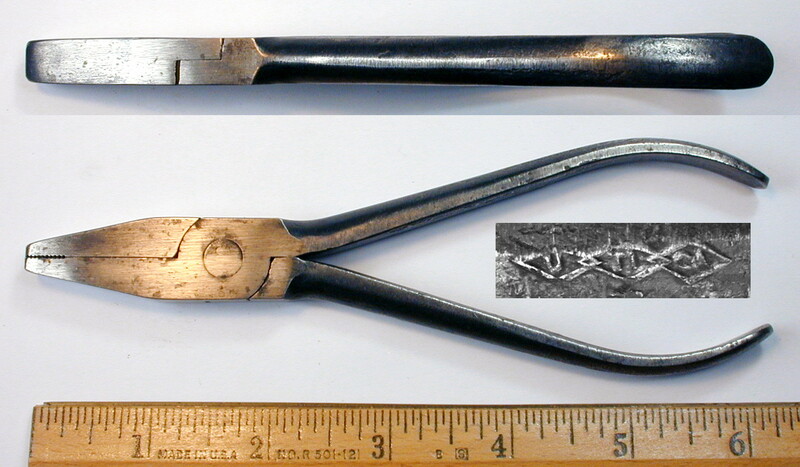 51 at the left shows a still later example of the Utica 260-6 end nippers, stamped "Utica" and "USA" near the pivot, with "Lubring" and "Patented" on the reverse. The simplified marking with just "USA" instead of "Utica, N.Y." suggests production around 1960 or later, when production moved to the Orangeburg factory. Fig. 52. Utica 260-7 End Nippers, with Insets for Side View and Marking Detail, ca. 1944-1948. Fig. 52 at the left shows a pair of Utica 260-7 end nippers, marked "Utica Tools" and "Utica, N.Y. U.S.A." near the pivot, with "Lubring Joint" and the 3-Diamonds logo on the reverse. The "Lubring" marking refers to the Barnes 1948 patent #2,441,552, which describes a method of joint construction to provide continuous lubrication. 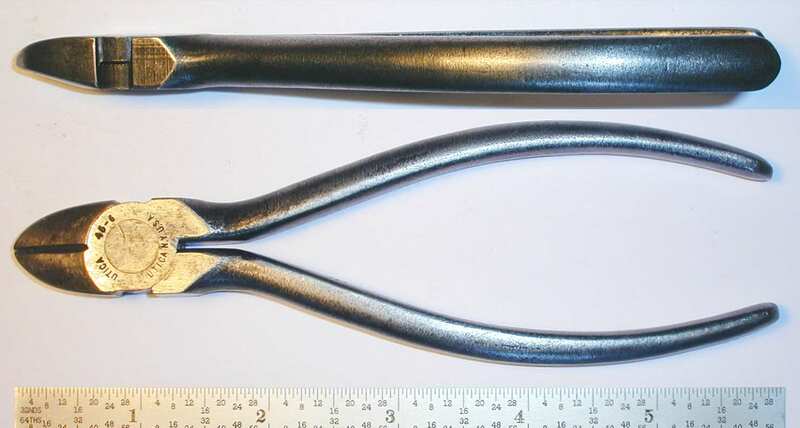 Although not marked with a patent pending notation, this pair of pliers is thought to be slightly earlier than the previous two examples, which were clearly marked to indicate the patented status. Fig. 53. Utica 360-7 7 Inch End Nippers, with Insets for Side View and Jaw Detail, ca. 1944-1960. Fig. 53 at the left shows a pair of Utica 360-7 7 inch end nippers, marked "Utica Tools" and "Utica, N.Y. U.S.A." near the pivot. The overall length is 7.2 inches, and the finish is black oxide. Fig. 54. Utica 38-4 Diagonal Cutting Pliers, ca. 1944-1960. Fig. 54 shows a pair of Utica 38-4 spring-loaded diagonal cutters, marked "Utica NY USA" near the pivot. The overall length is 4.4 inches, and the finish is black oxide. Fig. 55. Utica 39-7 Diagonal Cutting Pliers, with Inset for Side View, ca. 1944-1960. Fig. 55 at the left shows a pair of Utica 39-7 diagonal cutters, marked "Utica Tools" and "Utica N.Y. USA" near the pivot. The overall length is 7.3 inches, and the finish is polished steel. Fig. 56. Utica 40-7 7 Inch Diagonal Cutting Pliers, with Inset for Side View, ca. 1944-1960. Fig. 56 shows a pair of Utica 40-7 7 inch diagonal cutting pliers, marked "Utica Tools" and "Utica, N.Y. U.S.A." near the pivot. The overall length is 7.1 inches, and the finish is black oxide. The next figures show several examples of the popular Utica 41-6 diagonal cutting pliers. Fig. 57A. Utica 41[-6] 6 Inch Diagonal Cutting Pliers, with Insets for Side View and Reverse Detail, ca. 1930s. Fig. 57A shows an earlier pair of Utica 41[-6] 6 inch diagonal cutters, stamped with "U.D.F.&T.Co." and "Alloy Steel" on the face, with the 3-Diamonds logo across center. The top inset shows a side view of the pliers, illustrating the cross-hatched gripping pattern on the handles. Fig. 57B. Utica 41-6 6 Inch Diagonal Cutting Pliers, with Inset for Side View, ca. Mid 1930s to 1943. Fig. 57B shows a somewhat later pair of Utica 41-6 6 inch diagonal cutters, stamped with "Utica Drop Forge & Tool Co." and "Utica, N.Y. U.S.A." around the pivot, with "Alloy Steel" across the center. The overall length is 6.0 inches, and the finish is black oxide. The handles have a cross-hatched gripping pattern with traces of red paint, although the paint is not known to be original. Fig. 58. Utica 41-6 Diagonal Cutting Pliers, with Inset for Side View, ca. 1944-1960. Fig. 58 at the left shows a later pair of Utica 41-6 diagonal cutters, marked "Utica Tools" and "Utica, N.Y. USA" around the pivot, with the "41 6" model on top of the pivot. Fig. 59. Utica 41-6 Diagonal Cutting Pliers, with Inset for Side View, ca. 1944-1960. Fig. 59 at the left shows a pair of Utica 41-6 pliers very similar to the previous example, but with slightly different markings "Utica 41-6" and "Utica, N.Y. USA" around the pivot. Fig. 60. Utica No. 43 6 Inch Box-Joint Diagonal Cutters, with Insets for Side View and Marking Detail. Fig. 60 at the left shows an early pair of Utica 43-6 box-joint diagonal cutting pliers, stamped "Utica, N.Y." with the 3-Diamonds logo on the face, and with a 3-Diamonds logo forged into the underside of the handles. The overall length is 6.2 inches, and the finish is plain steel with polished faces. Although not marked with a model number, these pliers were identified by illustrations in the 1926 Utica catalog. That catalog offered two models of box-joint diagonal cutters, the No. 42 with a plain cutting edge and the No. 43 with a hole for wire stripping. Fig. 61. Utica 45-6 Aviation Diagonal Cutters, with Inset for Side View. Fig. 61 at the left shows a pair of Utica 45-6 diagonal cutting pliers, marked "Utica 45-6" and "Utica, N.Y. USA" near the pivot. The overall length is 5.9 inches, and the finish is black oxide. The Utica catalog describes this model as specially designed for aviation applications, with a shorter nose and with the pivot closer to the cutting edges for better leverage. The Gas and Burner style was also offered by a number of other manufacturers, and currently we're unsure of when and by whom the pattern was first introduced. Utica was offering the No. 1300 Gas and Burner Pliers at least as early as 1910, based on an advertisement in the Hardware Dealer's Magazine from that time. The pliers were available in sizes 5, 6, 7, 8, and 10 inches. We'll begin this section with an example believed to represent the earliest gas and burner models. Fig. 62. Utica  8 Inch Gas and Burner Pliers, with Insets for Side View and Marking Detail, ca. 1912-1914. Fig. 62 shows an early pair of Utica  8 inch gas and burner pliers, stamped near the pivot with "U.D.F. & T. Co." and the Utica linked-chains logo, an unusual transitional marking currently known only by this example. The pliers are also marked with "Pat. Apd. For" and the 3-Diamonds logo forged into the underside of the handle, as shown in the middle inset. The top inset shows a side view of the pliers, illustrating the diamond checkered gripping pattern on the handles. This gripping pattern began appearing in Utica advertisements in 1913. The lower inset shows a close-up of the transitional marking, clearly showing the older "linked chains" form of the Utica logo at the bottom. The presence of both the linked-chains logo and the successor 3-Diamonds trademark suggests production fairly soon after the introduction of the 3-Diamonds logo in (late) 1910. The estimated manufacturing date can be refined by noting the presence of the diamond checkered gripping pattern on the handles, a feature first advertised in 1913. Based on these combined features, we would estimate the production date as late 1912 or 1913. Another detail to note on these early gas-and-burner pliers is that ends of the handles include a screwdriver point. This feature appears to have continued into the 1920s, but is not found on later models. This next figure show a rare early version the Utica 1300 gas and burner pliers in the smallest standard size. Fig. 63. 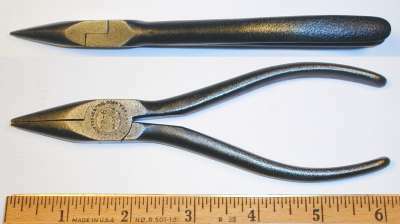 Utica Early [1300-5] 5 Inch Gas and Burner Pliers, with Insets for Side View and and Marking Detail, ca. 1910-1912. Fig. 63 shows a rare early pair of Utica  5 inch gas and burner pliers, marked only with the 3-Diamonds logo forged into the underside of the handles. Note the screwdriver tip on one of the handles. The overall length is 5.5 inches, and the finish is plain steel. The top inset shows a side view of the pliers, illustrating the plain handles. The lower inset shows the forged-in 3-Diamonds logo as it appears on the underside of the handles. The lack of a company marking suggests that this may have been made as contract production, and the plain handles suggest production before 1912. The next figures show several generations of the Utica 1300-6 gas and burner pliers. Fig. 64A. Utica Early [1300-6] 6 Inch Gas and Burner Pliers, with Insets for Side View, Construction, and Marking Detail, ca. 1913-1920. Fig. 64A shows an early pair of Utica 1300 6 inch gas and burner pliers, marked with "Pat. Apd. For" and the 3-Diamonds logo forged into the underside of the handles. The overall length is 6.6 inches, and the finish is plain steel. The top inset shows a side view of the pliers, illustrating the early diamond checkered gripping pattern on the handles. Utica introduced this handle pattern in 1912 or 1913. The middle (left) inset shows a close-up of the jaws, illustrating the small serrated opening at the tip of the jaws. This is a defining characteristic for the "Gas and Burner" style. The lower inset shows the forged-in 3-Diamonds logo as it appears on the underside of the handles, bracketed by the "Pat. App. For" marking. Fig. 64B. Utica 1300-6 6 Inch Gas and Burner Pliers, with Insets for Side View and Marking Detail, ca. 1920s. Fig. 64B shows a somewhat later pair of Utica 1300 6 inch gas and burner pliers in the nominal 6 inch size, marked with the 3-Diamonds logo across the pivot. The top inset shows a side view of the pliers, illustrating the later diamond checkered gripping pattern on the handles. The lower inset shows the forged-in 3-Diamonds logo as it appears on the underside of the handles, followed by "App. For" in raised letters. Fig. 65. Utica 1300-6 6 Inch Gas and Burner Pliers, with Inset for Handle Detail, ca. 1944-1960. Fig. 65 at the left shows a somewhat later example of the Utica 1300-6 6 inch gas and burner pliers, marked "Utica N.Y. U.S.A." near the pivot. The inset shows the cross-hatched gripping pattern on the handles. The marking style indicates production from the mid 1940s through 1950s. Fig. 66. Utica Early [1300-7] 7 Inch Gas and Burner Pliers, with Insets for Side View and Marking Detail, ca. 1913-1920. Although not marked with a model number, these pliers were identified by the illustration in a 1926 Utica catalog. The illustration there shows this style of "fashioned" handle with tapered tips, for use as a screwdriver or light-duty prybar. Fig. 67. Utica 1300[-8] 8 Inch Gas and Burner Pliers, with Insets for Side View and Jaw Detail, ca. 1920s. Fig. 67 shows a pair of Utica 1300[-8] gas and burner pliers in the nominal 8 inch size, stamped with the 3-Diamonds logo across the pivot. The small lower inset shows the serrations on the jaw, with the longitudinal grooves at the tip characteristic of "burner" pliers. Fig. 68. Utica 1300-10 10 Inch Gas and Burner Pliers, with Insets for Side View and Detail, ca. 1944-1960. Fig. 68 shows a pair of Utica 1300-10 10 inch gas and burner pliers, stamped "Utica, N.Y. U.S.A." around the pivot. The lower inset shows the small serrated opening in the end of the jaws, a defining characteristic for the "Gas and Burner" style. In addition to the more popular 1300 series, Utica also offered the model 130 gas and burner pliers with Button-style wire cutters. Fig. 69. Utica 130[-8] 8 Inch Gas and Burner Pliers, with Insets for Side View and Marking Detail, ca. 1915 to 1920s. Fig. 69 shows a pair of Utica 130[-8] 8 inch gas and burner pliers with Button-style wire cutters, stamped with "Guaranteed" and the 3-Diamonds logo across the pivot. The inset between the handles shows the forged-in 3-Diamonds logo on the underside of the handles, bracketed by "Pat." and "App. For" in raised letters. The presence of the model number marking suggests a later production date. Fig. 70. Utica 20[-4] 4 Inch Flat-Nose Pliers, with Inset for Detail, ca. Early to Mid 1920s. Fig. 70 shows a pair of Utica 20[-4] 4 inch flat-nose pliers, stamped with the Utica 3-Diamonds logo on the pivot, and with the 3-Diamonds logo forged into the underside of the handles. The overall length is 4.2 inches, and the finish is plain steel. Fig. 71. Utica 20-5 5 Inch Flat-Nose Pliers, with Inset for Marking Detail, ca. 1911-1920. Fig. 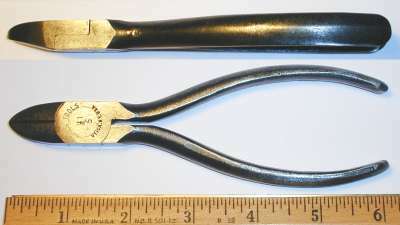 71 shows an early pair of Utica [20-5] 5 inch flat-nose pliers, marked with the Utica 3-Diamonds logo forged into the underside of the handles. 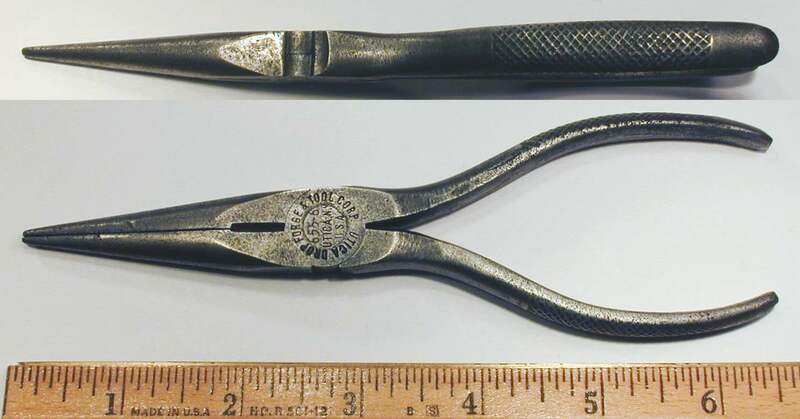 The model number is not marked on these pliers, but was found by reference to a 1926 Utica catalog. The absence of the model number marking suggests early production. The next figures show two generations of the Utica 20-6 flat-nose pliers. Fig. 72A. Utica [20-6] 6 Inch Flat-Nose Pliers, with Insets for Side View and Marking Detail, ca. 1911-1920. Fig. 72A shows an early pair of Utica [20-6] 6 inch flat-nose pliers, marked with the Utica 3-Diamonds logo forged into the underside of the handles. The overall length is 6.2 inches, and the finish is plain steel. Fig. 72B. 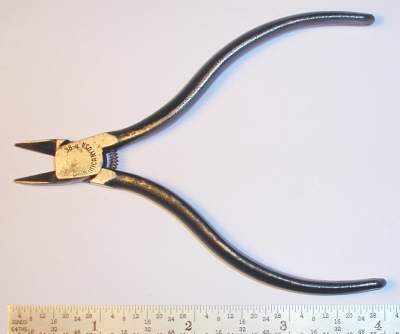 Utica 20-6 6 Inch Flat-Nose Pliers, with Inset for Side View, ca. 1944-1960. Fig. 72B shows a later pair of Utica 20-6 6 inch flat-nose pliers, stamped with the model number and "Utica N.Y. U.S.A." around the pivot. Fig. 73. Utica No. 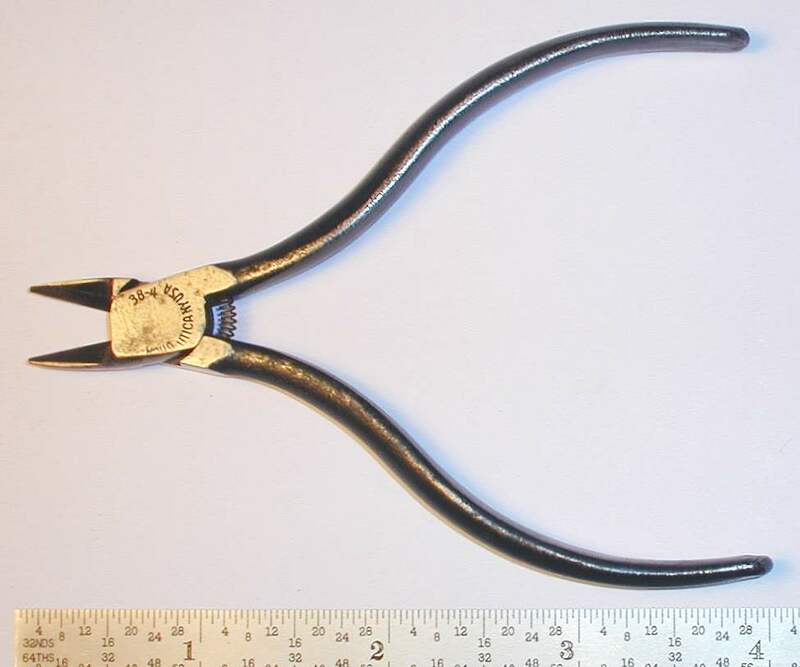 21-4 4 Inch Round-Nose Pliers, with Inset for Marking Detail, ca. 1944-1960. Fig. 73 at the left shows a pair of Utica 21-4 4 inch round-nose pliers, stamped "Utica NY USA" near the pivot. The overall length is 4.1 inches, and the finish is plain steel. Fig. 74. Utica 21[-5] 5 Inch Round-Nose Pliers, with Inset for Marking Detail, ca. 1920s. Fig. 74 at the left shows an early pair of Utica 21[-5] 5 inch round-nose pliers, stamped with the Utica 3-Diamonds logo near the pivot, and with the logo forged into the underside of the handles as well. The overall length is 5.6 inches, and the finish is black oxide. The inset shows a close-up of the forged-in 3-Diamonds logo as it appears on the underside of the handles. Utica offered the No. 22 series of short needlenose (or "chain nose") pliers in nominal sizes 3, 4, 4.5, 5, 5.5, and 6 inches. All sizes had bow handles. These models were available by 1915 (or earlier), and the 1915 catalog recommended them for such applications as jewelry, watchmaking, and electrical work. Fig. 75. Utica 22-4-1/2 4.5 Inch Short Needlenose Pliers, ca. 1944-1960. Fig. 75 shows a pair of Utica 22-4-1/2 4.5 inch short needlenose pliers, stamped with "Utica Tools" and "Utica, N.Y." around the pivot. The overall length is 4.5 inches, and the finish is plain steel, with extensive pitting due to rust. Fig. 76. Utica 22-5 5 Inch Short Needlenose Pliers, ca. 1944-1960. Fig. 76 shows a pair of Utica 22-5 5 inch short needlenose pliers, marked "Utica, N.Y. U.S.A." near the pivot. The overall length is 5.0 inches, and the finish is black oxide. Fig. 77. Utica 22[-5-1/2] 5.5 Inch Short Needlenose Pliers. Fig. 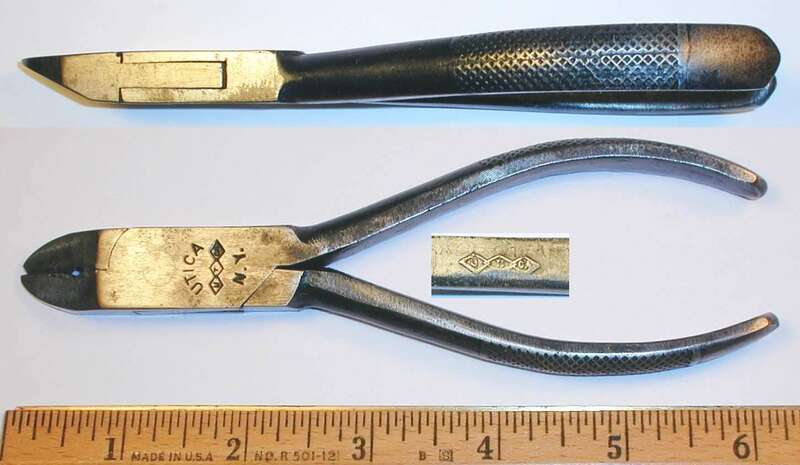 77 shows an early pair of Utica 22[-5-1/2] 5.5 inch short needlenose pliers, marked with the model number and 3-Diamonds logo. Fig. 78. Utica 22-6 6 Inch Short Needlenose Pliers, with Inset for Side View, ca. 1925-1943. Fig. 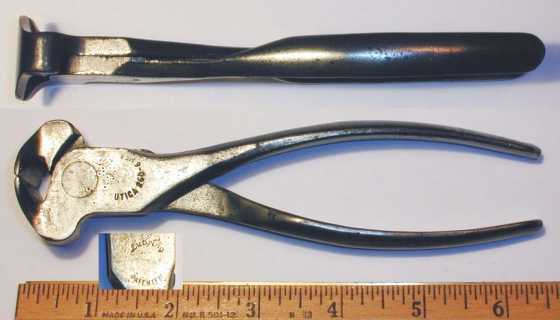 78 shows an earlier pair of Utica 22-6 6 inch short needlenose pliers. The stamped markings have "Utica Drop Forge & Tool Corp." and "Utica, N.Y. U.S.A." arranged in a circle, with the model number and "Made in U.S.A." across the pivot. The overall length is 6.1 inches, and the finish is black oxide. Fig. 79. Utica 22-6 6 Inch Short Needlenose Pliers, with Inset for Side View, ca. 1960s to 1970s. Fig. 79 shows a later pair of Utica 22-6 6 inch short needlenose pliers. The etched markings show "Utica" and "USA", but are rather difficult to read. Fig. 80. Utica B120 Long-Nose Pliers, with Insets for Marking and Handle Pattern, ca. 1914 to Mid 1920s. Fig. 80 shows a pair of Utica B120 pliers, marked "Utica, N.Y." with the 3-Diamonds logo. The overall length is 5.3 inches, and the finish is plain steel. The inset illustrates the diamond checkered gripping pattern. Fig. 81. Utica No. 31 Duckbill Assembly Pliers, with Insets for Side View and Reverse Detail. Fig. 81 shows a pair of Utica No. 31 duckbill assembly pliers, marked with the Utica 3-Diamonds logo on the reverse. The overall length is 7.9 inches, and the finish is plain steel. The upper inset shows a profile view of the pliers, illustrating the wide nose and handles. The Utica catalog mentions the use of these pliers in assembly work, though of course many other applications are possible. The next two figures show examples of the No. 82 needlenose assembly pliers, with minor differences in marking. Fig. 82A. Utica No. 82 8 Inch Needlenose Assembly Pliers, with Inset for Reverse Detail. Fig. 82A shows a pair of Utica No. 82 8 inch needlenose assembly pliers, stamped with the Utica 3-Diamonds logo on the reverse. Fig. 82B. Utica 82-8 8 Inch Needlenose Assembly Pliers, with Insets for Side View and Marking Detail. Fig. 82B shows a pair of Utica 82-8 8 inch needlenose assembly pliers, stamped with the Utica 3-Diamonds logo and the "82-8" model number. Fig. 83. Utica 86-6 6 Inch Long Flat-Nose Pliers, with Insets for Side View and Marking Detail, ca. 1944-1960. Fig. 83 shows a pair of Utica 86-6 6 inch long flat-nose pliers, stamped with "Utica" and "Utica, N.Y. U.S.A." around the pivot. Fig. 84. Utica 86[-8] 8 Inch Long Flat-Nose Pliers, with Insets for Side View and Marking Detail, ca. 1920s. Fig. 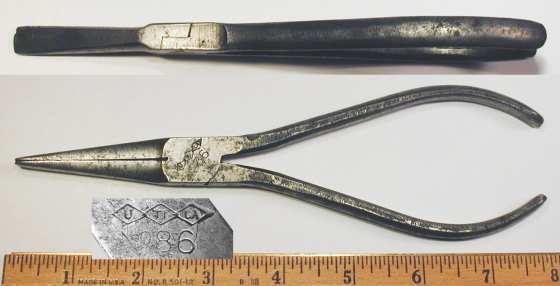 84 shows a pair of Utica 86[-8] 8 inch long flat-nose pliers, stamped with the model number and 3-Diamonds logo over the pivot. Fig. 85. Utica 87-7 7 Inch Long Duckbill Pliers, with Inset for Side View, ca. Late 1920s to Mid 1940s. Fig. 85 shows a pair of Utica 87-7 7 inch long duckbill pliers, marked "Utica Drop Forge & Tool Corp." and "Utica, N.Y. U.S.A." near the pivot. This model was not listed in the 1926 Utica catalog, but was available in the 1939 catalog No. 50. The catalog description calls these "Extra Long Duck Bill Pliers". Fig. 86. Utica 227 6.5 Inch Needlenose Pliers, ca. 1948-1960. Fig. 86 shows the Utica 227 6.5 inch needlenose pliers, marked "Utica, N.Y. USA" near the pivot, with "Lubring" and "Patented" on the reverse. The overall length is 6.6 inches, and the finish is black oxide. The "Lubring" marking refers to a patented method of providing continuous lubrication, as described by patent #2,441,552, issued to W.A. Barnes in 1948. The pivot joint includes a disk of highly compressed but porous powdered iron, which can soak up oil and slowly release it to maintain lubrication for the joint. Fig. 87. Utica 777-6 6 Inch Needlenose Pliers, ca. 1944-1960. Fig. 87 shows the Utica 777-6 6 inch needlenose pliers, marked "Utica 777-6" and "Utica, N.Y. U.S.A." near the pivot. Fig. 88. Utica 1033-6 6 Inch Needlenose Pliers, ca. 1944-1960. Fig. 88 shows the Utica 1033-6 6 inch needlenose pliers, marked "Utica 1033-6" and "Utica, N.Y. USA" near the pivot. The overall length is 6.2 inches, and the finish is black oxide. The next figures show two generations of the Utica 654-6 pliers. Fig. 89. Utica 654-6 6 Inch Needlenose Pliers with Cutters, with Insets for Side View and Marking Detail, ca. 1942-1943. Fig. 89 shows an earlier pair of Utica model 654-6 6 inch needlenose pliers with side cutters, stamped "Utica Drop Forge & Tool Corp." around the pivot, with the model number and "Utica, N.Y. U.S.A." across the center. The overall length is 6.3 inches, and the finish is plain steel. These pliers are also marked with another "U.S.A." stamping above and to the right of the pivot, and the underside of the handles has a forged-in "V" code (perhaps for "Victory"). These extra markings are believed to indicate production for a government contract during the wartime years. 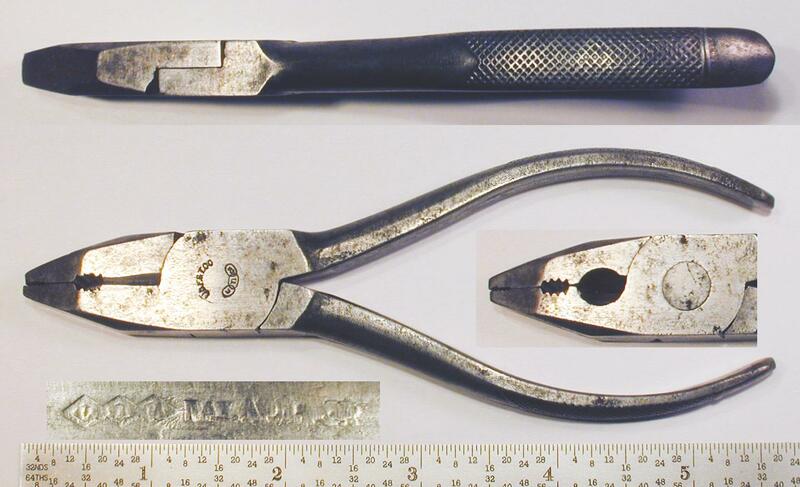 Since the standard markings on the pliers were in use up until late 1943, the production was likely in 1942-1943. Fig. 90. Utica 654-6 Needlenose Pliers with Cutters, ca. 1944-1960. Fig. 90 shows a somewhat later pair of Utica model 654-6 needlenose pliers with side cutters, stamped "Utica 654-6" and "Utica, NY USA" around the pivot. The overall length is 6.3 inches, and the finish is plain steel with painted handles. The next two figures show two generations of the model 655 pliers in the 6 inch size. Fig. 91. Utica 655-6 6 Inch Needlenose Pliers, with Insets for Side View and Reverse Detail, ca. 1920s. Fig. 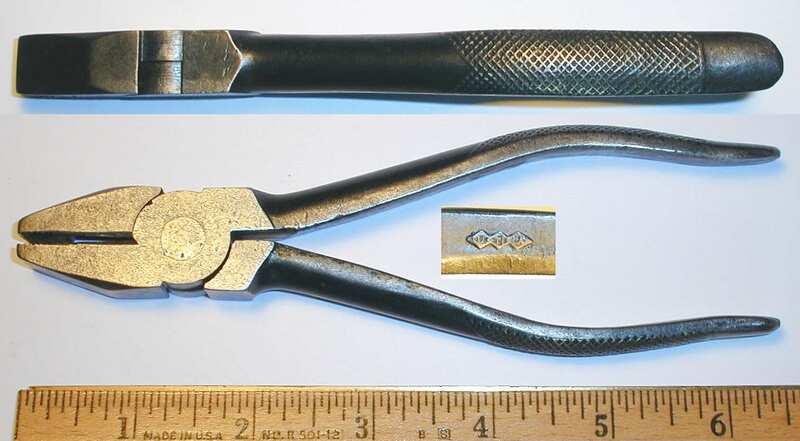 91 shows an earlier pair of Utica 655 6 inch needlenose pliers with side cutters, stamped with the model number and 3-Diamonds logo across the center. 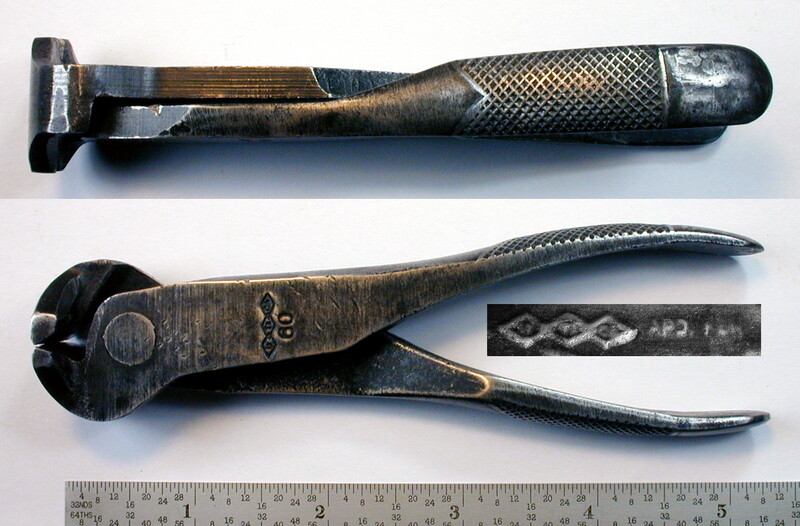 The upper inset shows a side view of the pliers to illustrate the squared-off diamond checkered gripping pattern. Fig. 92. Utica 655-6 Needlenose Pliers, with Inset for Side View, ca. 1925-1943. Fig. 92 shows a later pair of Utica model 655-6 needlenose pliers with side cutters, stamped "Utica Drop Forge & Tool Corp." around the pivot, with the model number and "Utica, N.Y. U.S.A." across the center. Fig. 93. Utica 888-6 6 Inch Bent Needlenose Pliers, with Inset for Top View, ca. 1944-1960. Fig. 93 shows the Utica model 888-6 6 inch bent needlenose pliers, with views from the side and top. 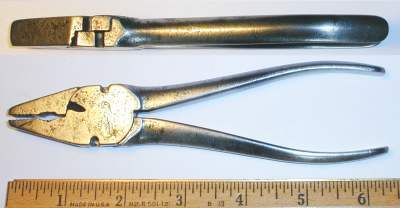 The pliers are marked "Utica 888-6" and "Utica, N.Y. USA" near the pivot, and the handles are smooth without a gripping pattern. The overall length (tip-to-tip) is 5.6 inches, and the finish is black oxide.